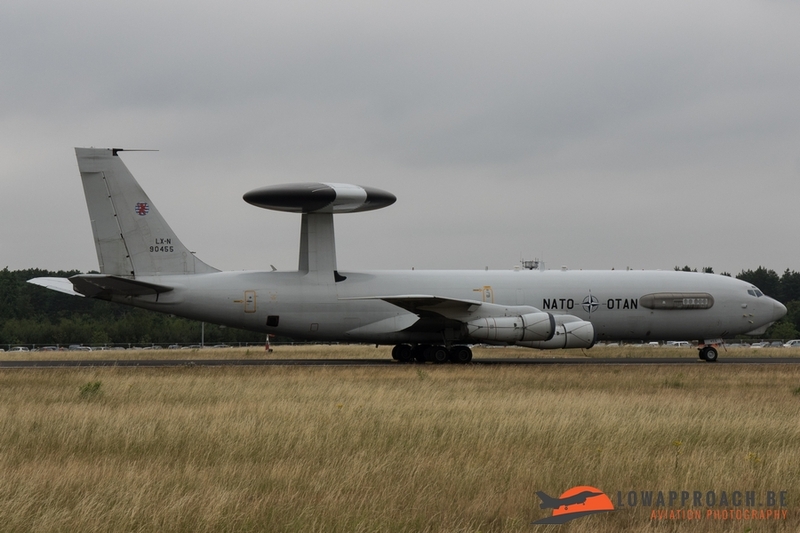 Base at Geilenkirchen organized a spottersday the day before the Open Door weekend to celebrate their 35th anniversary since the start of the E-3A Sentry operations. 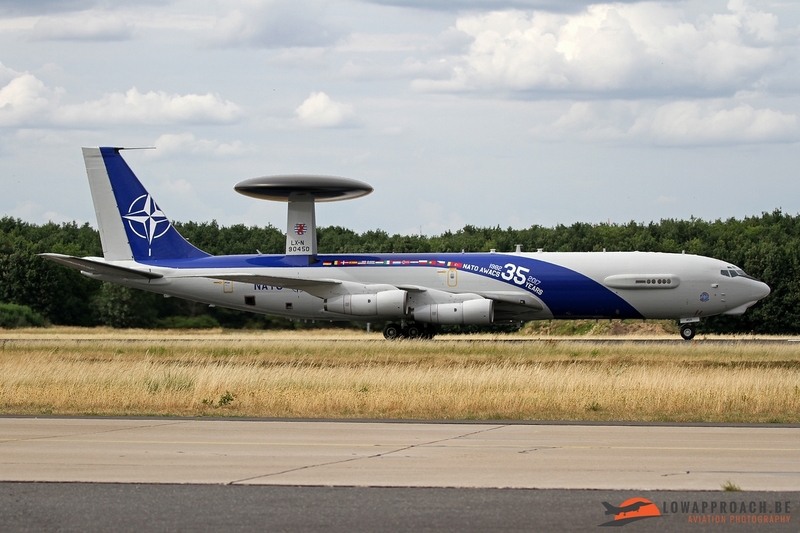 To participate at the spottersday you had to register yourself through a known spotters group. 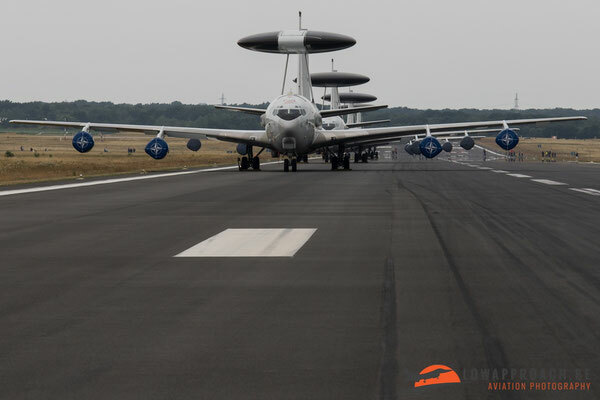 Upon arrival there was a little queue so that the guards could check if the identity matched with the received registered spotters. Once inside the spotters were guided towards the parking spot. 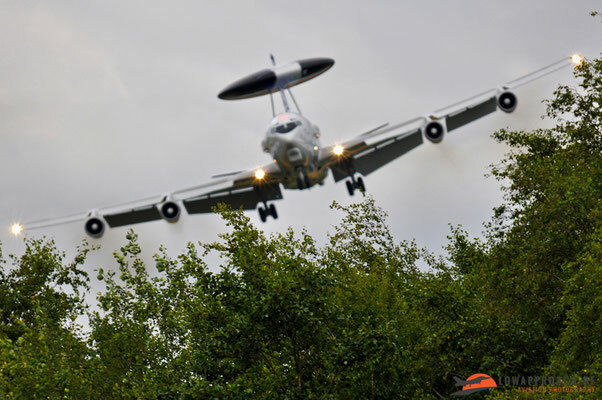 Some cars were pulled aside for a search, the other ones could drive straight ahead towards the parking. After the cars were parked all the spotters underwent a check from themselves and their camera bags. 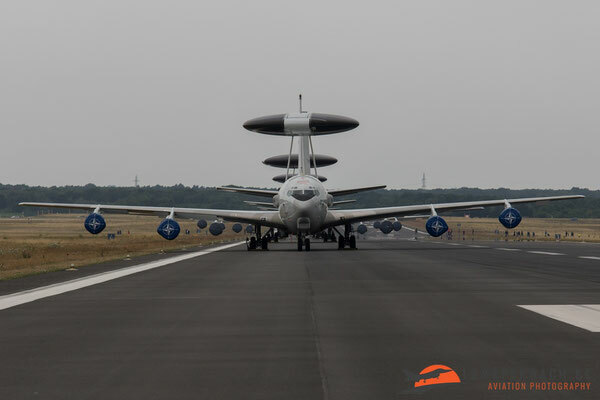 After the checks we could enter various busses that drove us to the designated spotters area next to the taxiway. The organizers had foreseen enough space for all the attending spotters. The day before the spottersday a couple of participating aircraft already arrived which we had rather seen arriving during the spottersday as these were mostly the most interesting ones. 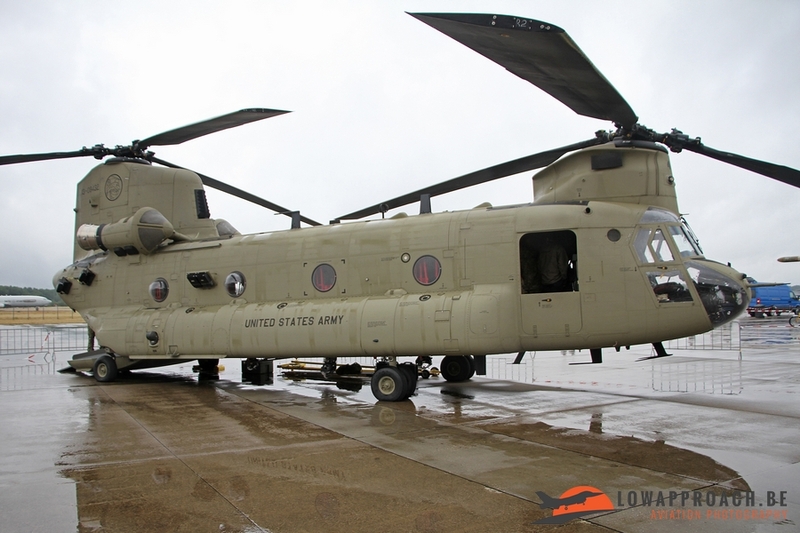 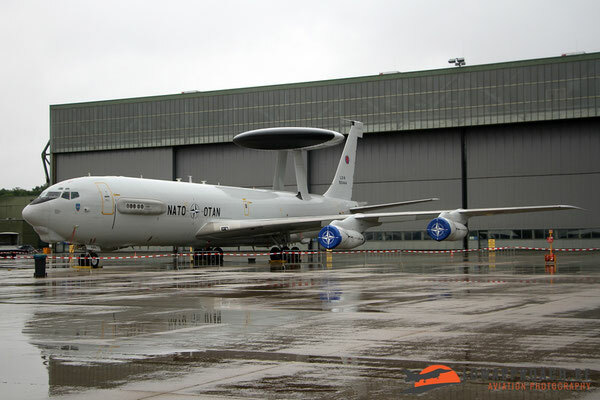 For example the Italian Air Force E-550, the US Army CH-47F and AH-64D, the UK E-3D. 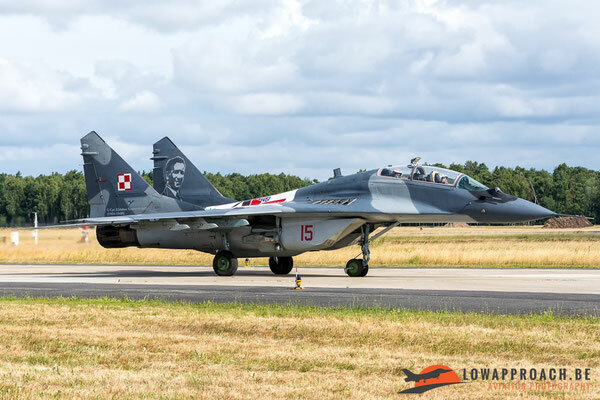 Another duo that had arrived the day before the spottersday was the Polish Air Force with a MiG-29 and a Su-22 twin-seater and to our surprise they were the first movements we saw at the spottersday. They performed a taxi-run in front of the spotters which was well appreciated! 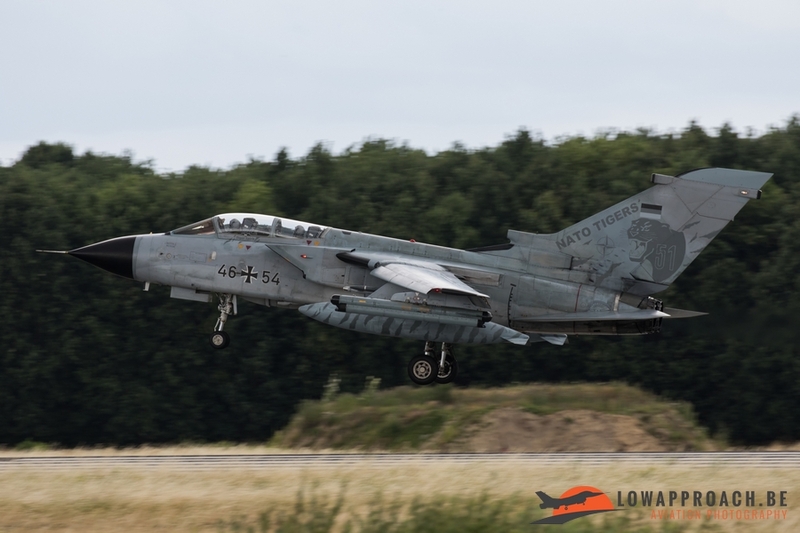 All the arriving aircraft for the Open Door backtracked the runway once they had landed and were guided with the help of the ATC past the spotters which resulted in some very nice pictures. 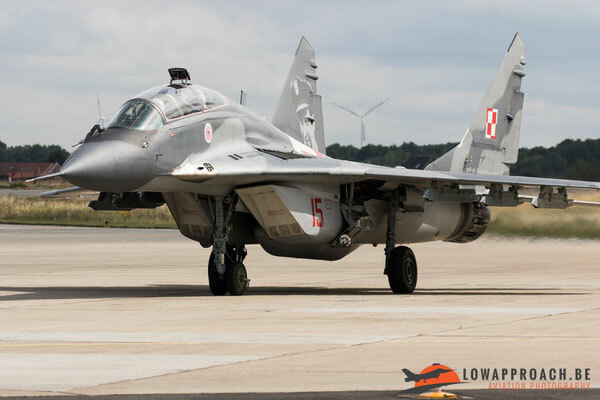 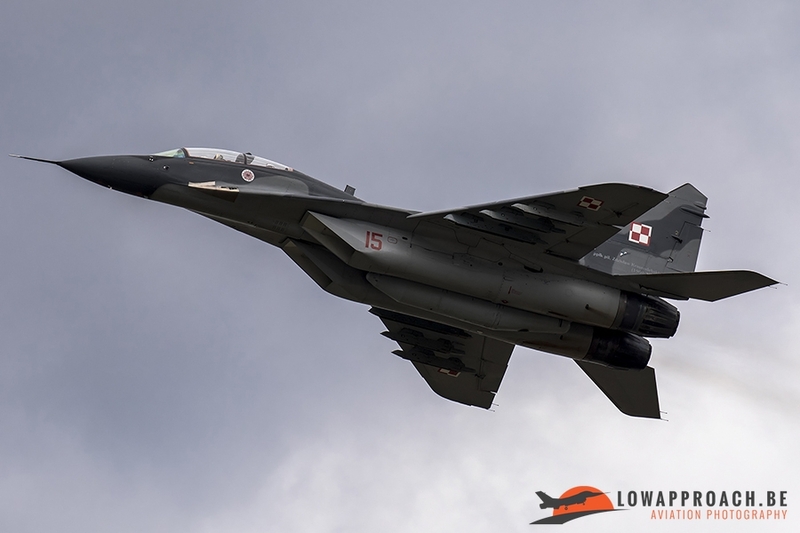 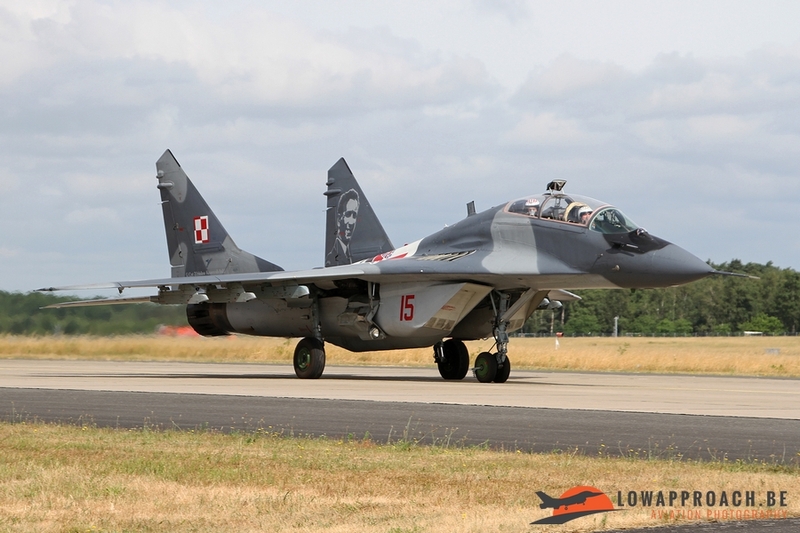 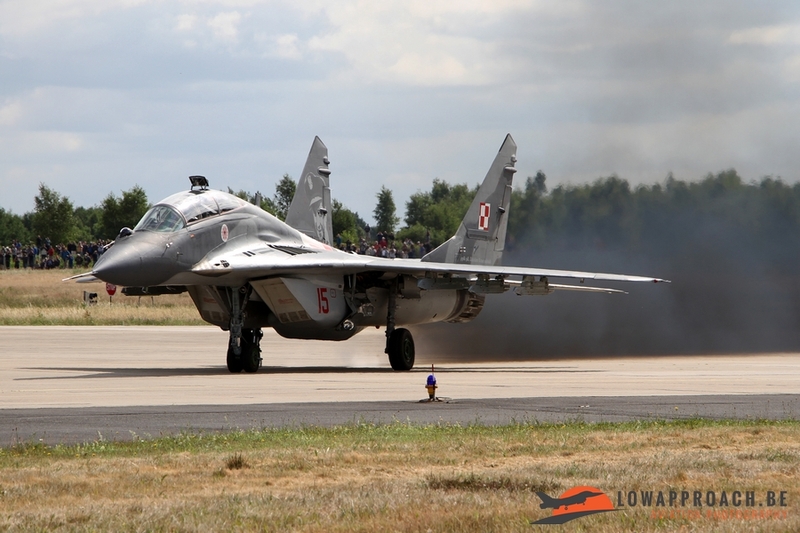 The Polish delegation also provided, apart from the MiG-29UB and Su-22UM3K, a M-28B1TD Bryza from the Air Force and a M-28B1R from the Navy. 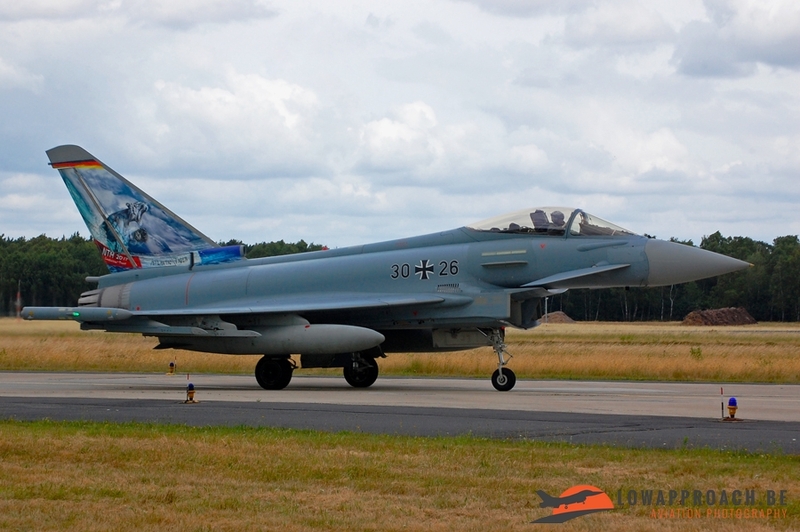 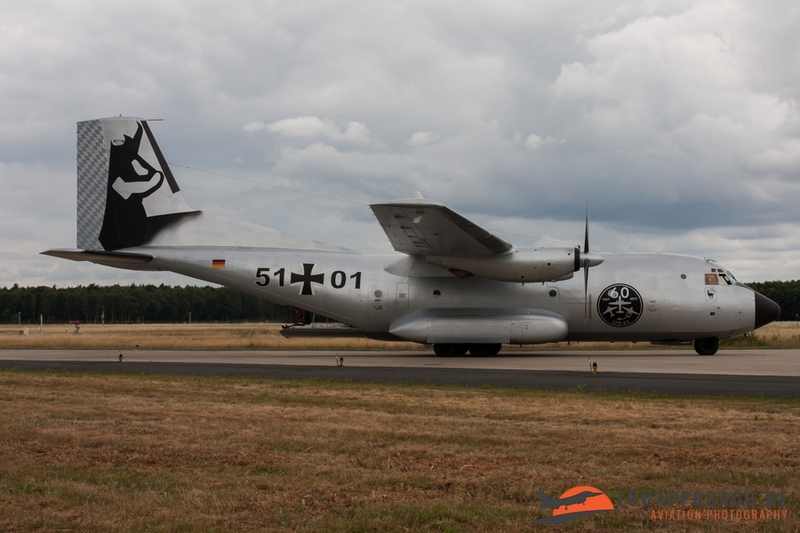 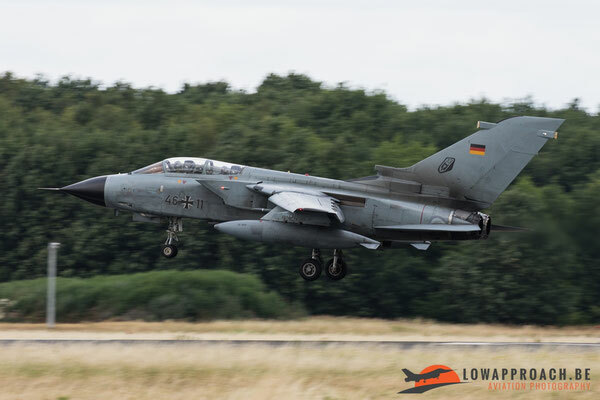 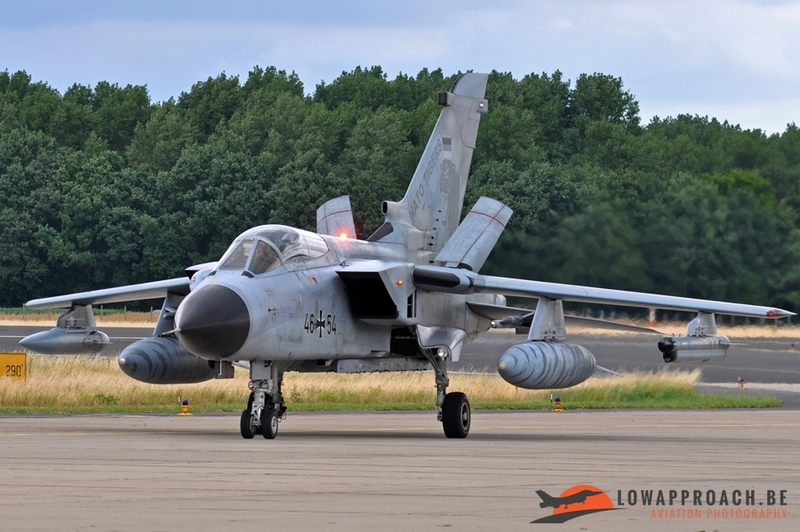 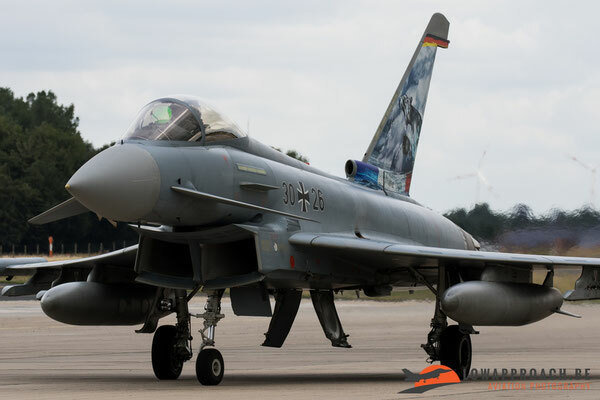 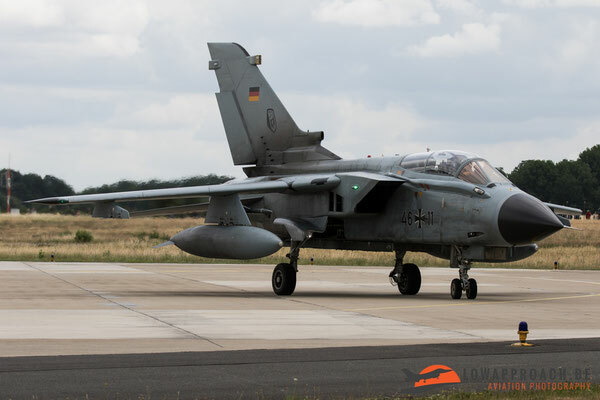 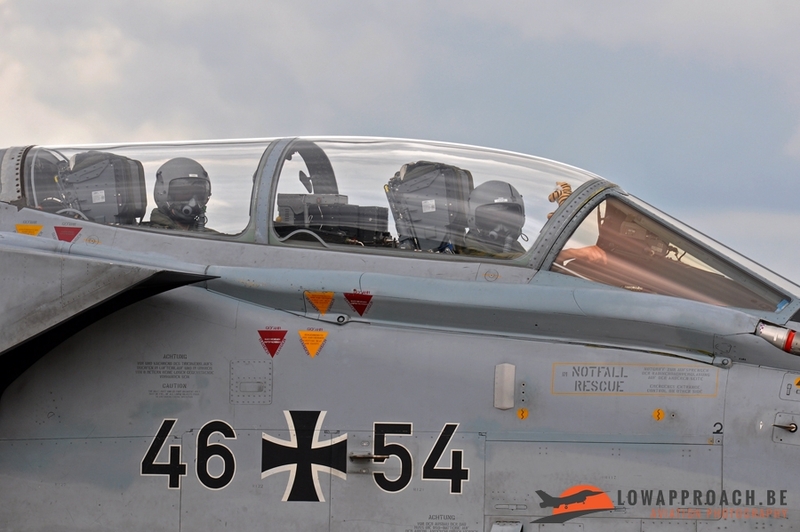 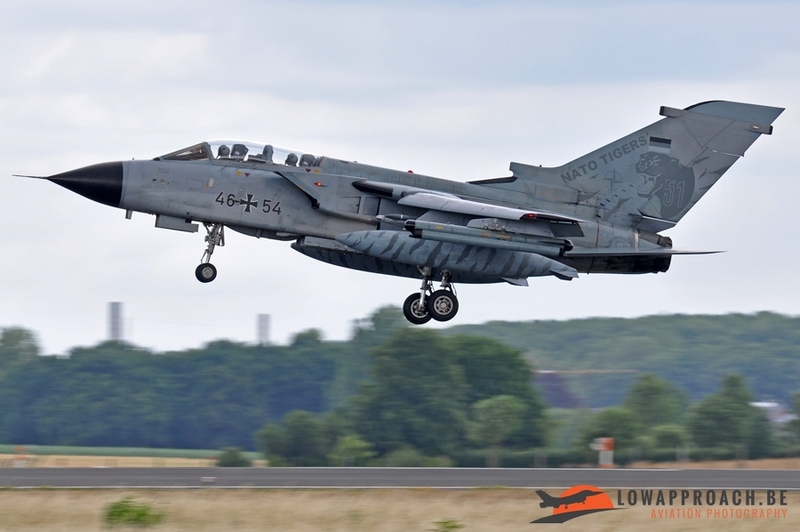 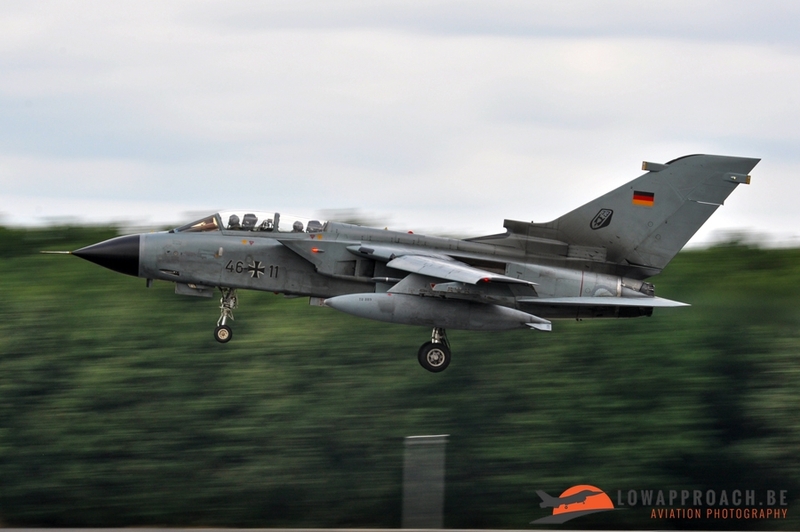 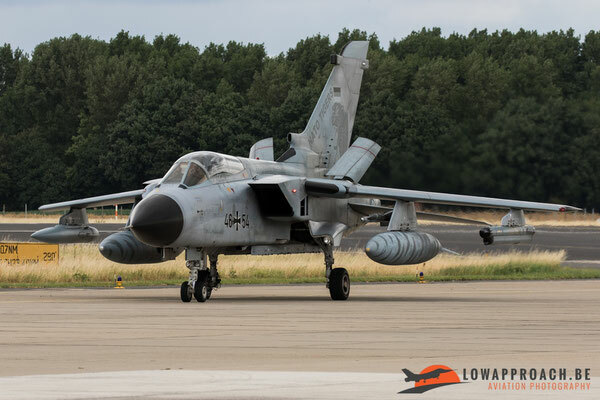 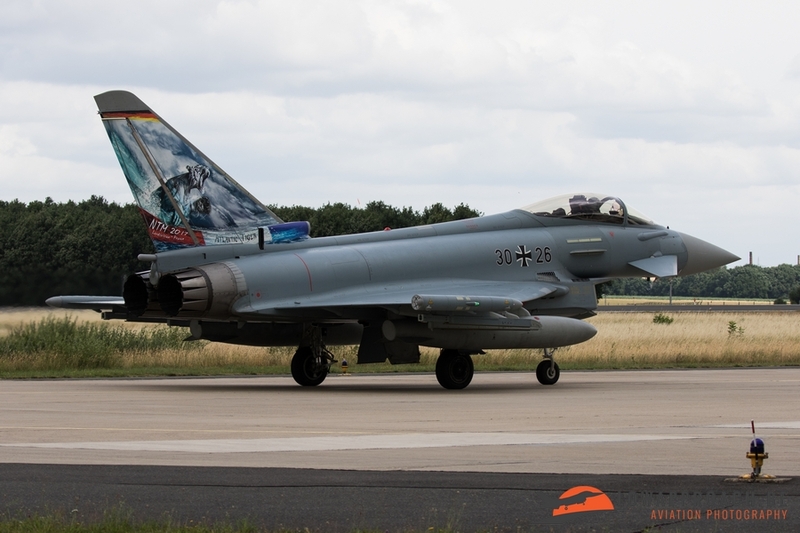 The German military was well presented for this years anniversary, they sent no less than 7 different aircraft to Geilenkirchen! 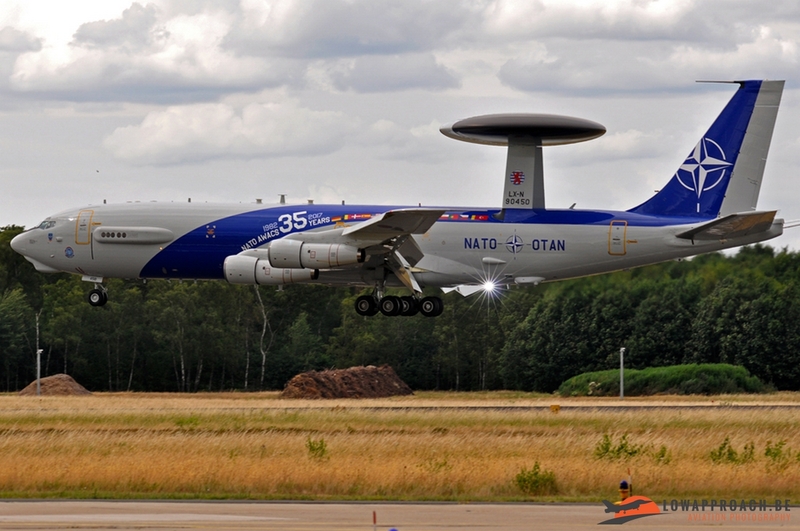 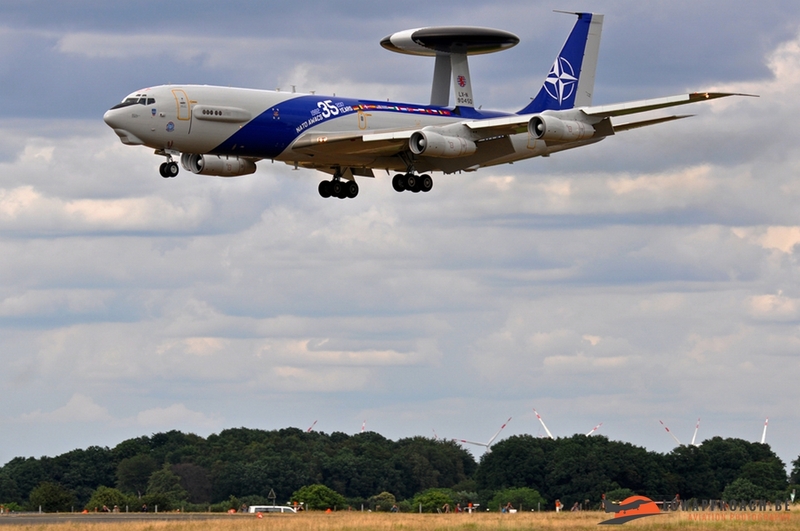 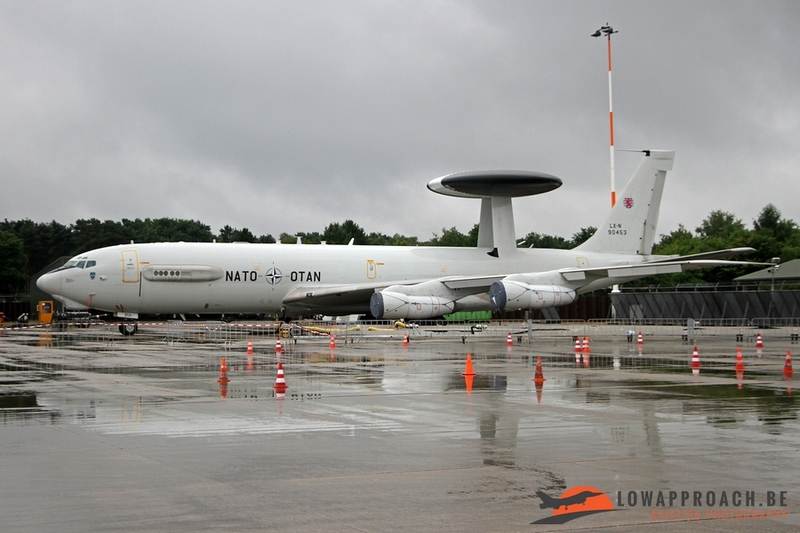 Also the Belgians sent a large delegation to Geilenkirchen for the 35th anniversary of the E-3A. 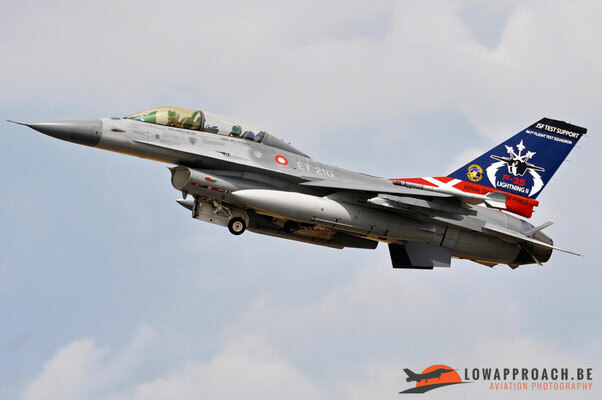 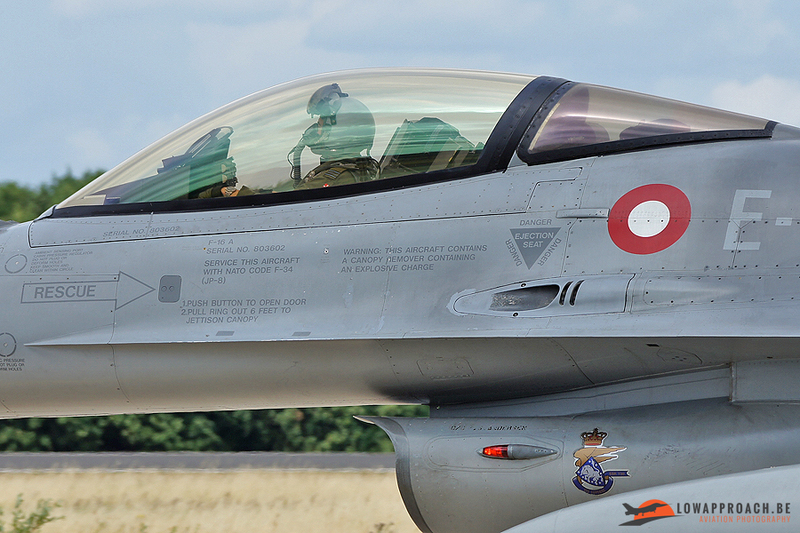 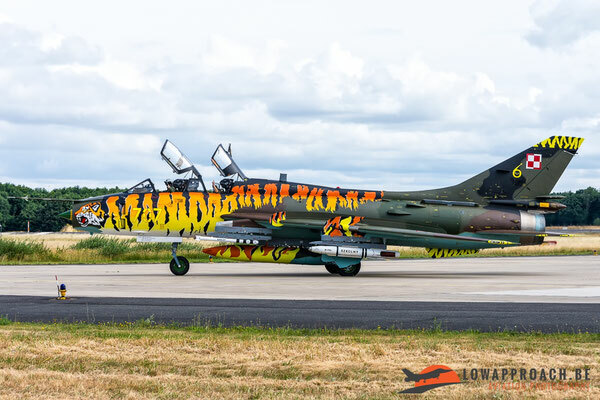 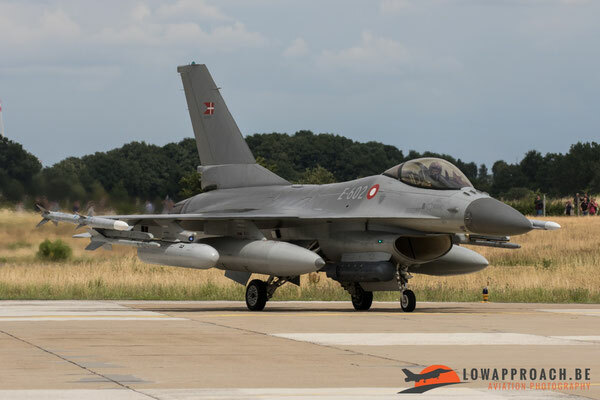 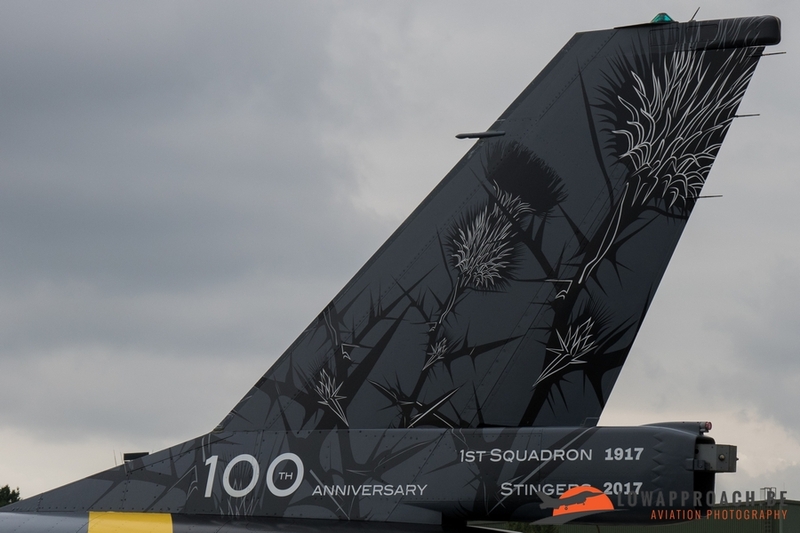 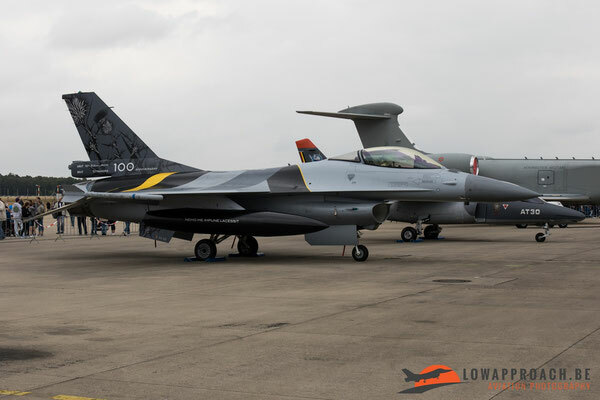 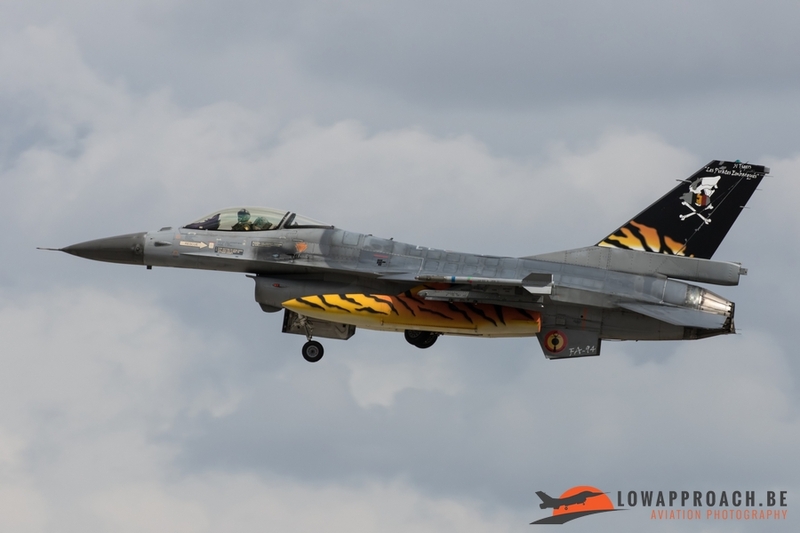 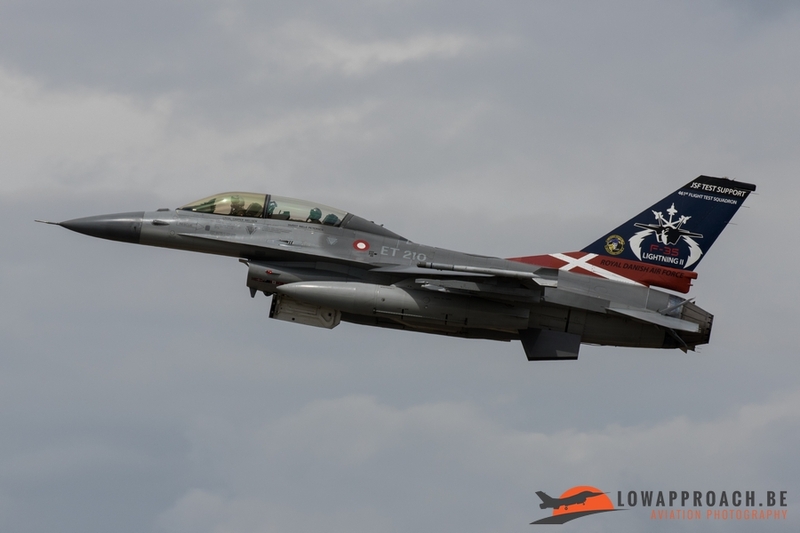 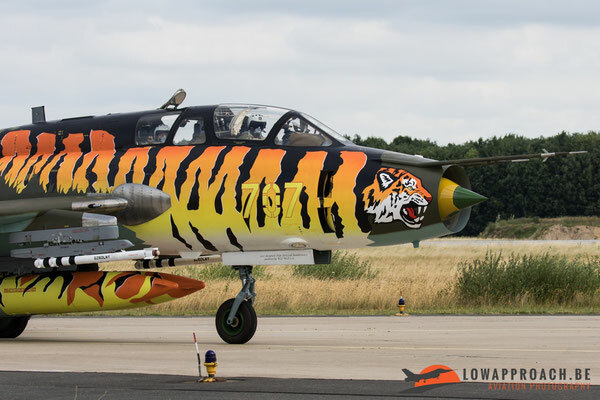 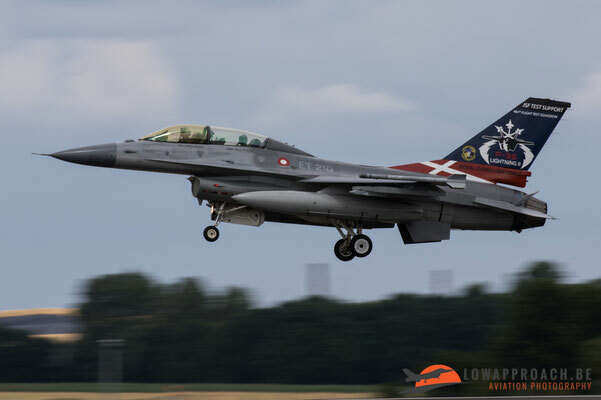 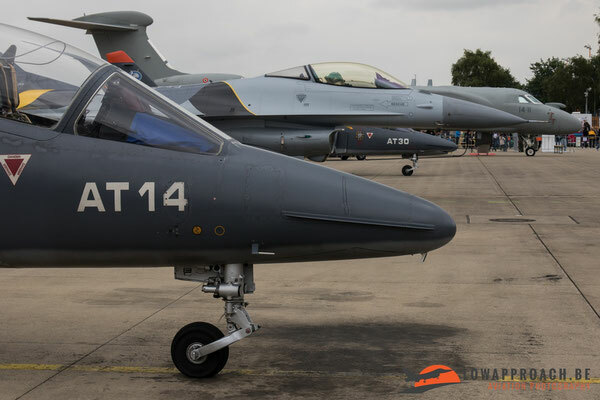 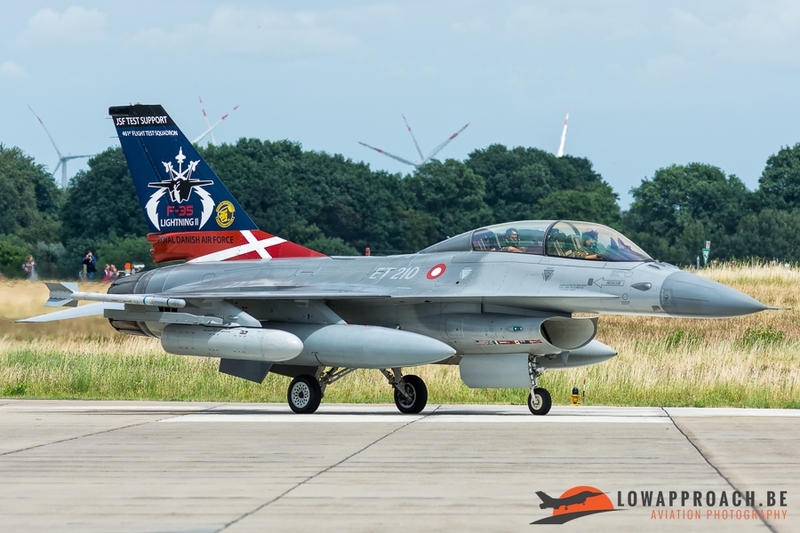 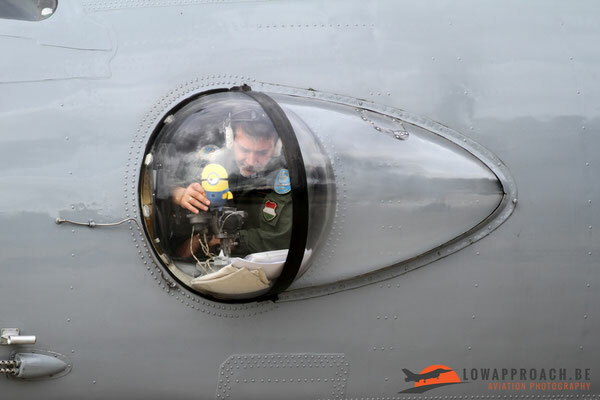 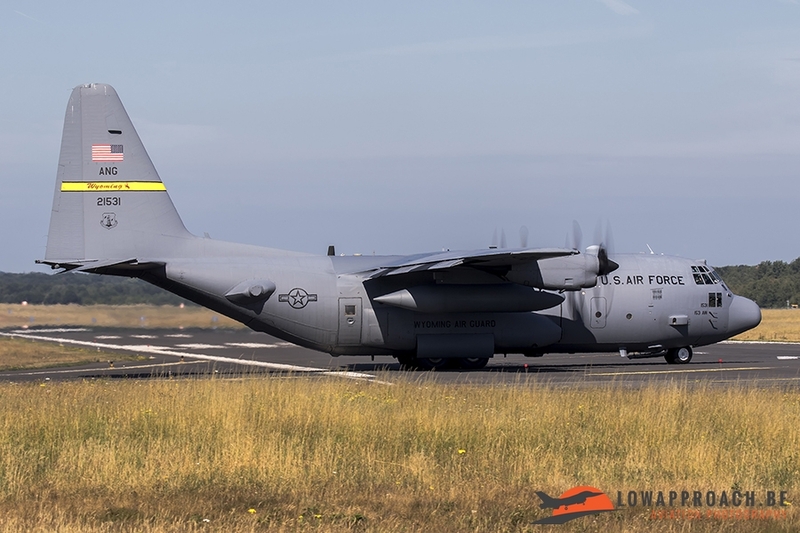 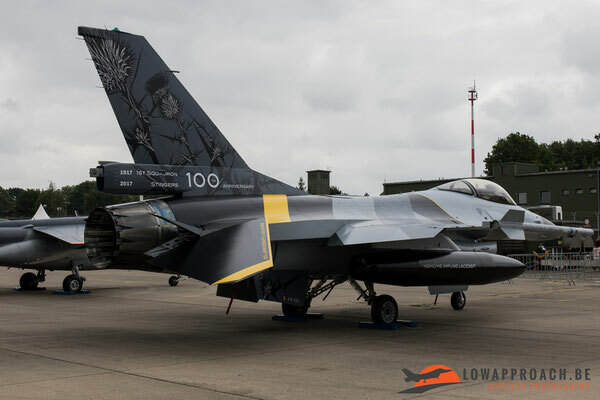 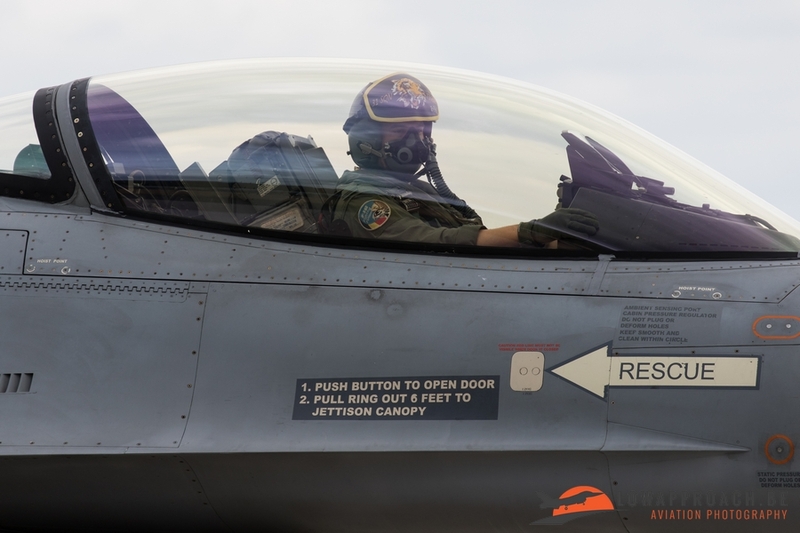 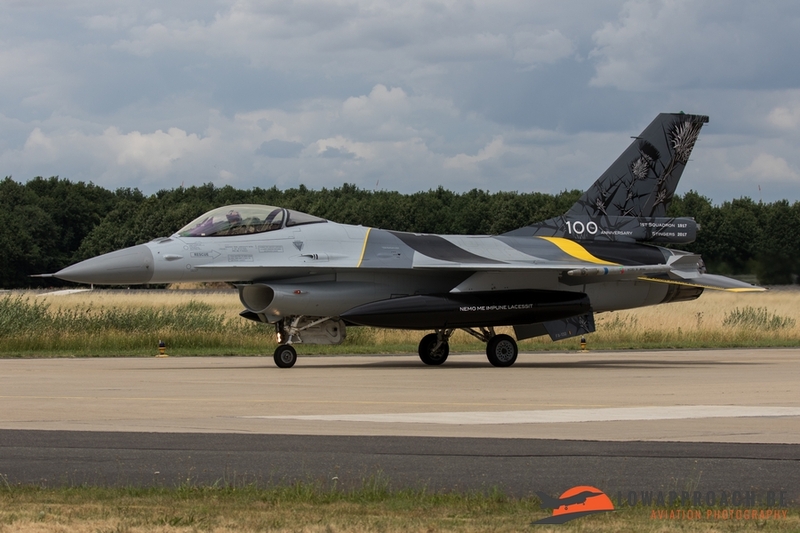 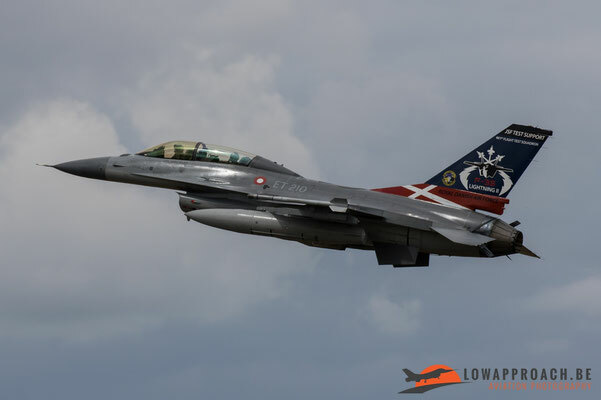 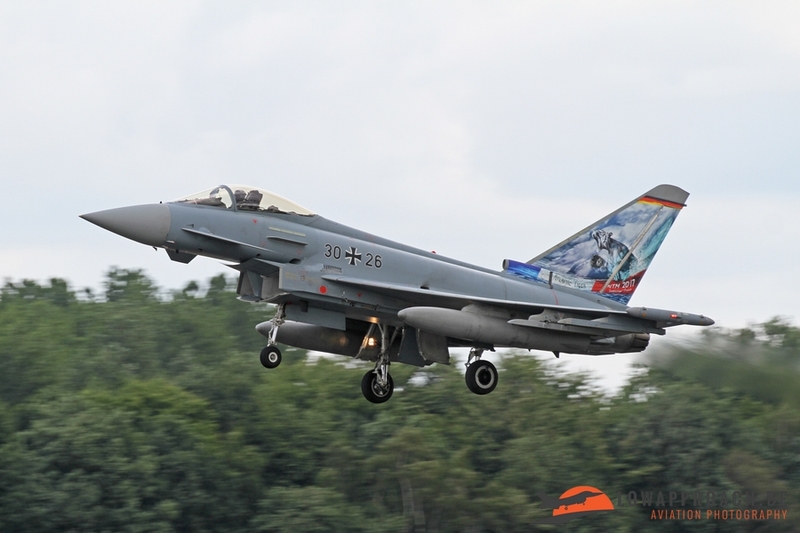 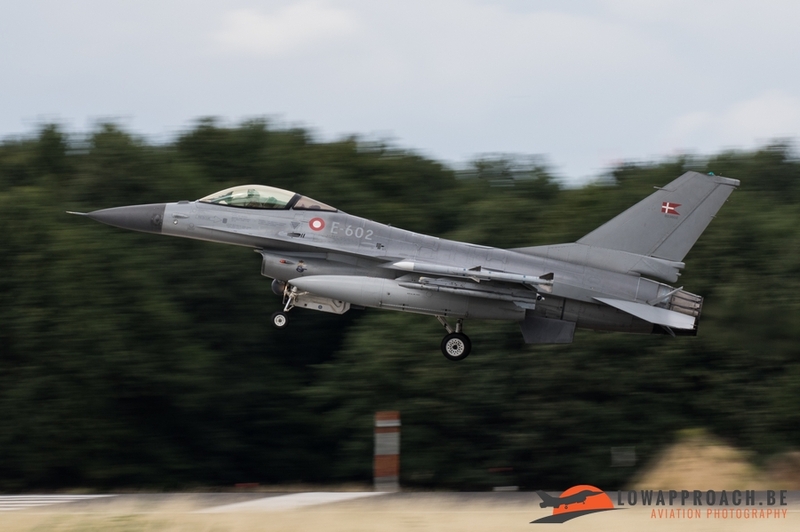 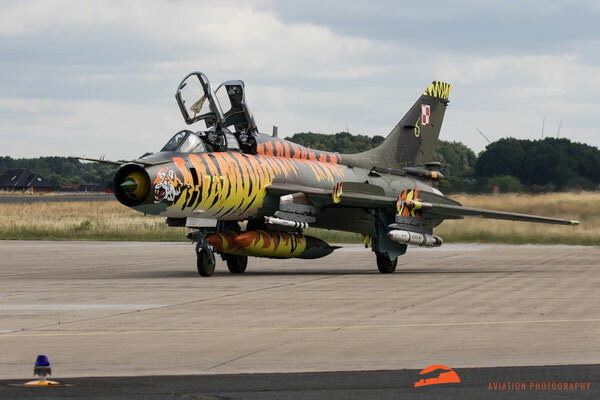 The 1st squadron, which celebrated its 100th anniversary in 2017, sent their special painted F-16 FA-132 and 31st squadron sent their specially decorated 2017 NATO Tiger Meet aircraft to the NATO Air Base. 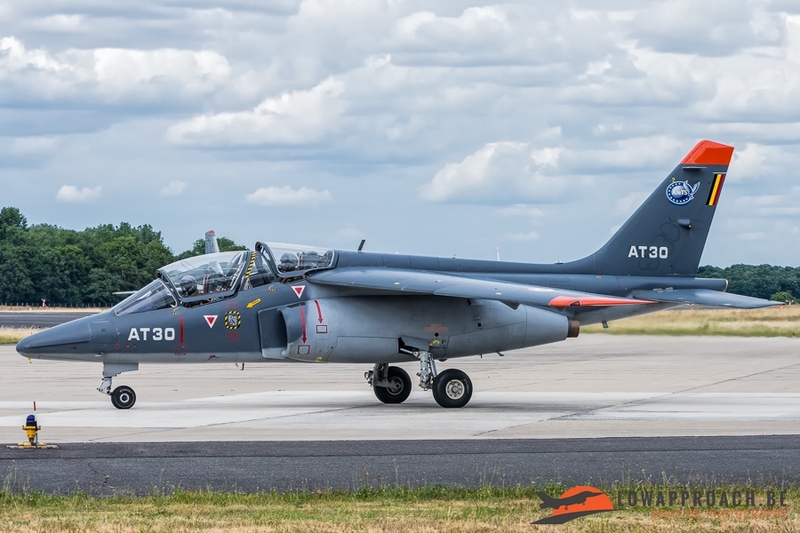 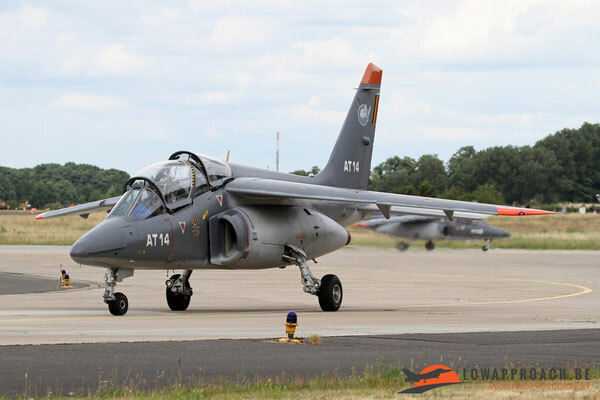 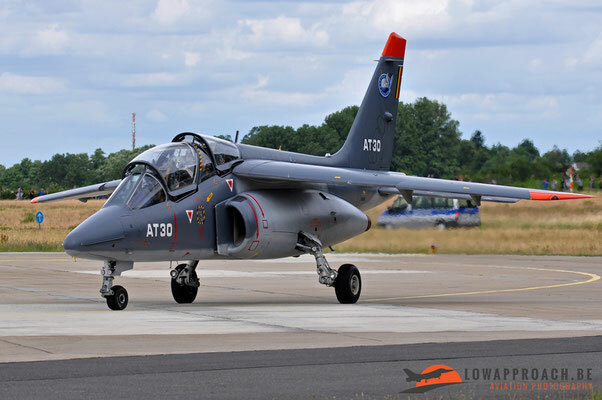 Apart from the 2 F-16’s the Belgians also brought over 2 Alpha Jets and a SF-260 but this one arrived a couple of days before the spottersday. 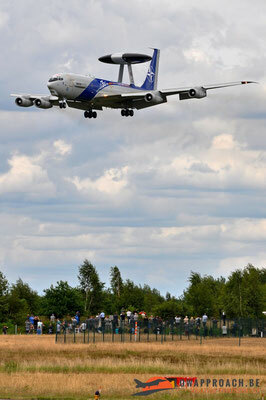 Apart from all the aircraft that had to arrive for the Open Door we also saw two departing planes. 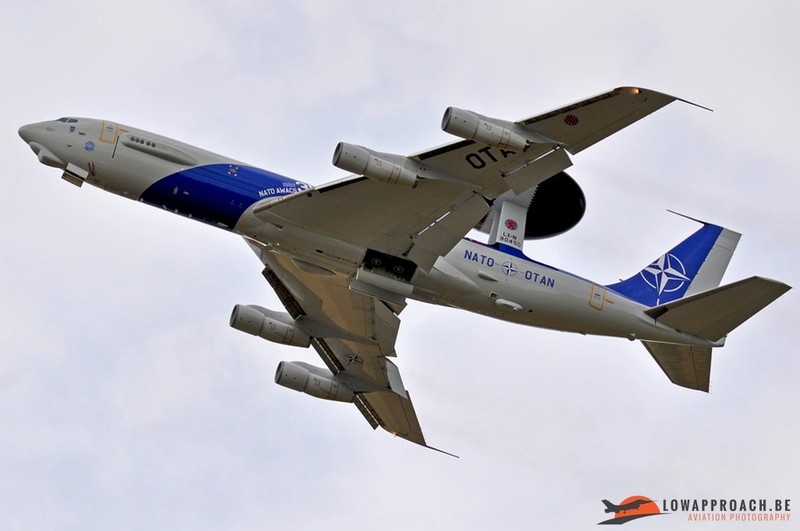 These were a C-37A from the USAFE and a KC-135R from the Kansas ANG. 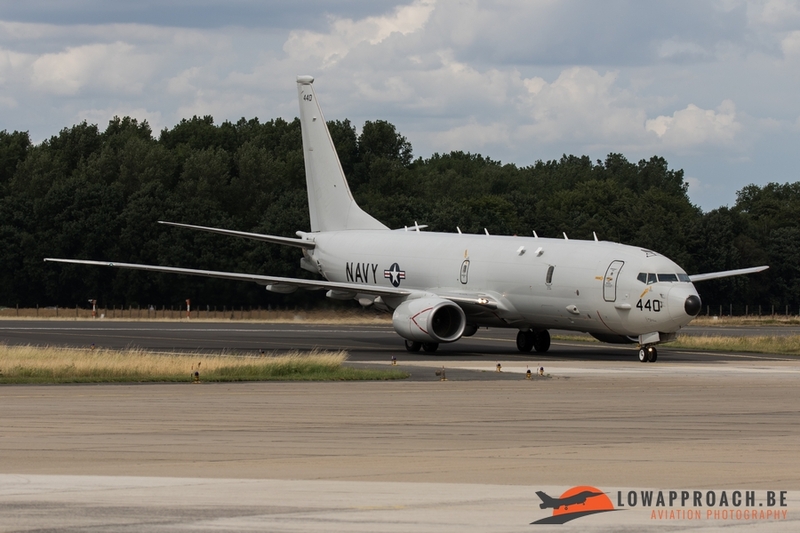 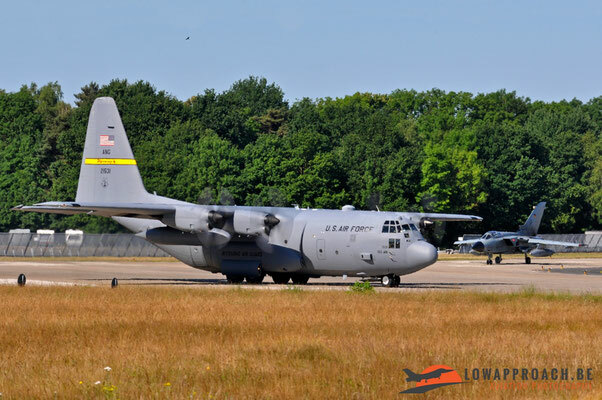 For the anniversary a P-8A from the US Navy and a C-130H from the 187th AS, 153rd AW, WY ANG arrived instead. 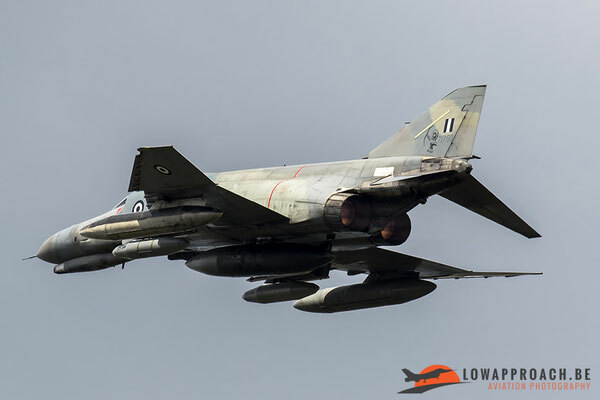 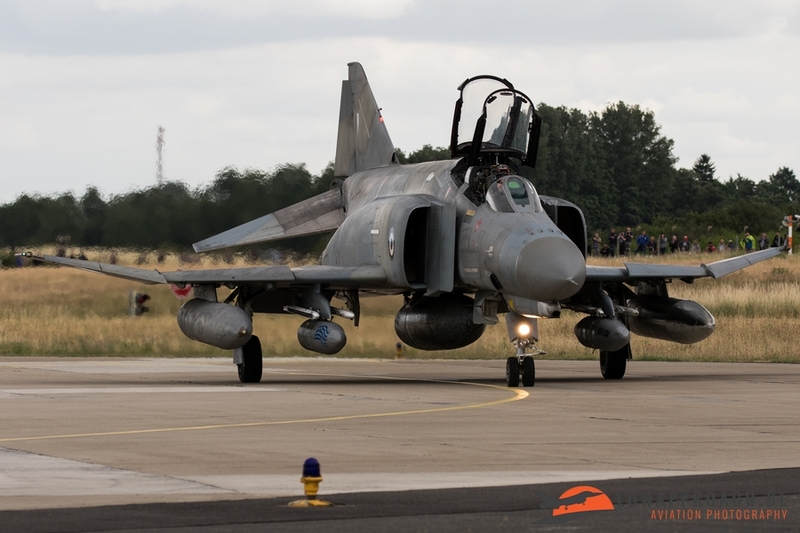 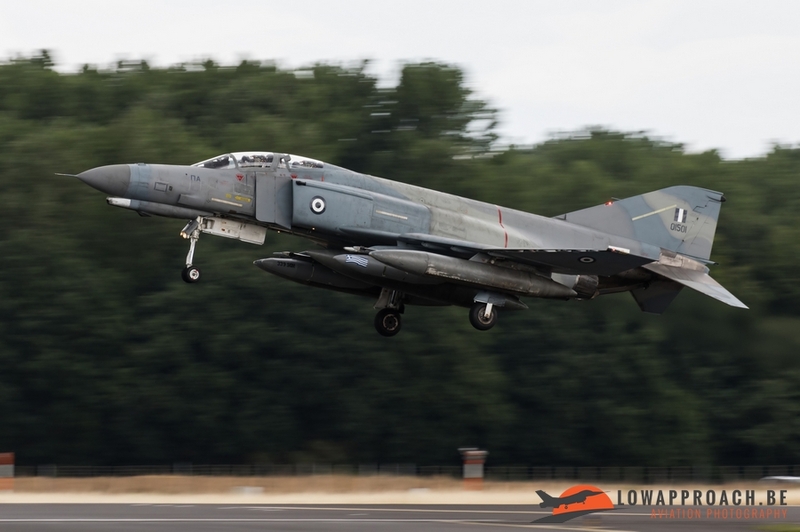 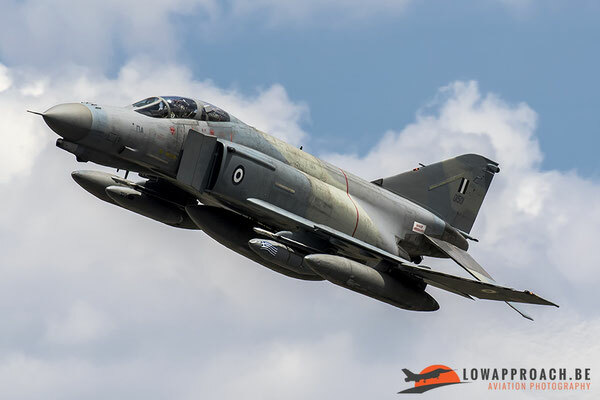 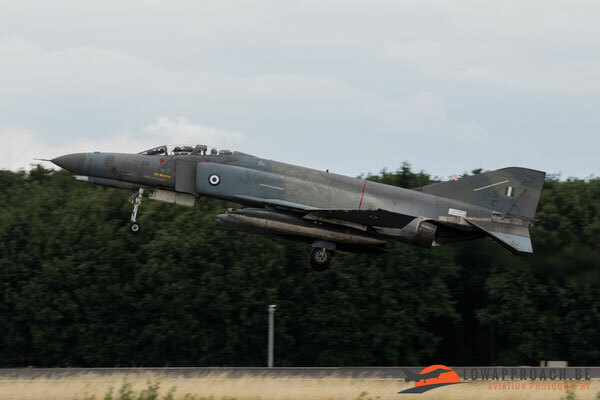 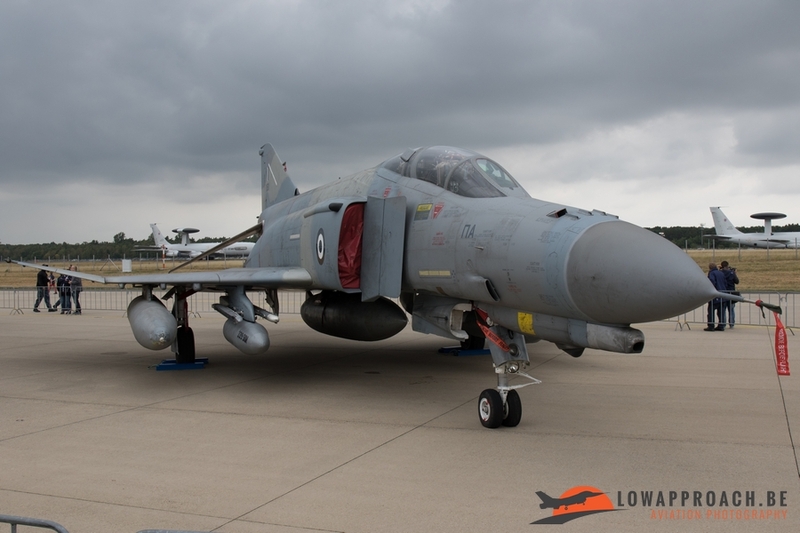 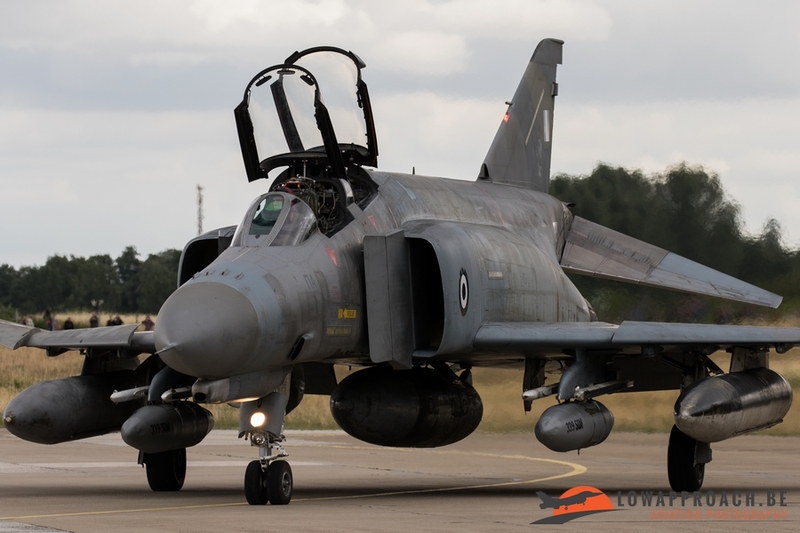 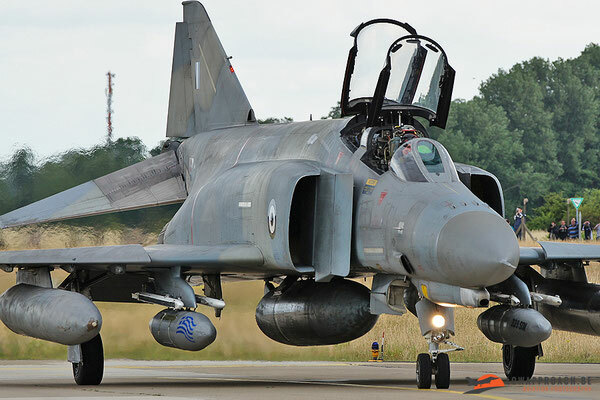 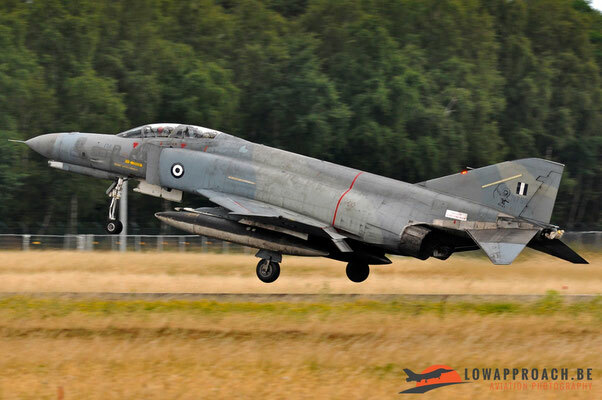 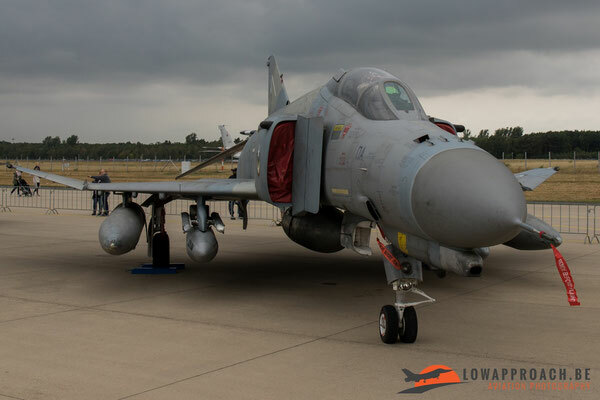 The Hellenic Air Force participated with a very nice duo, they came to Geilenkirchen with 2 F-4E AUP Phantoms. 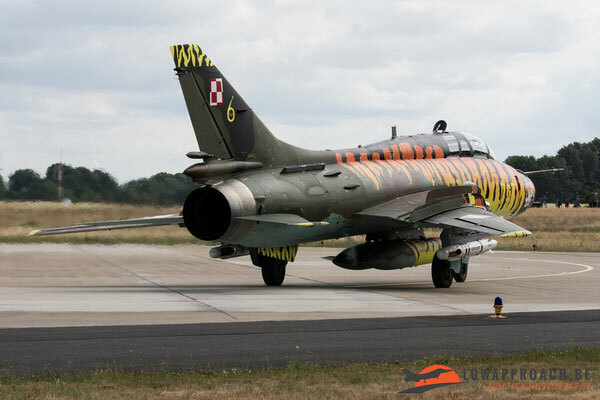 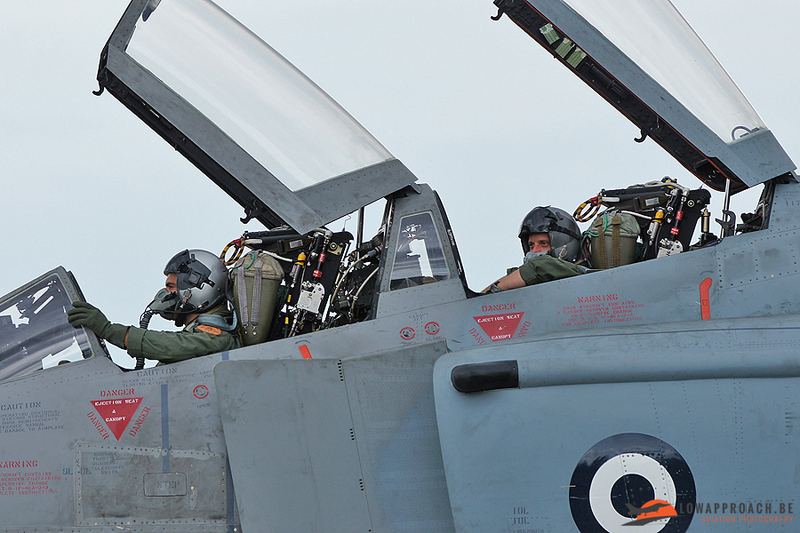 The aircraft came from 339 Squadron which is based at Andravida. 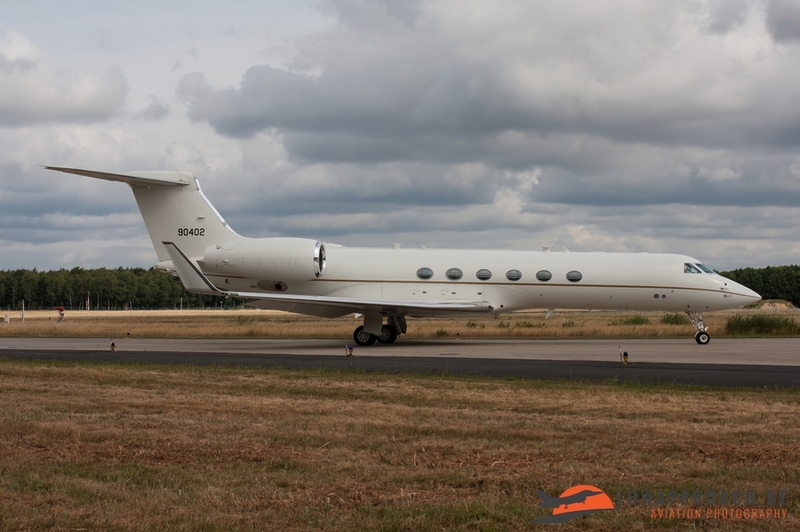 They reached Geilenkirchen with a fuel stop in Aviano, Italy. 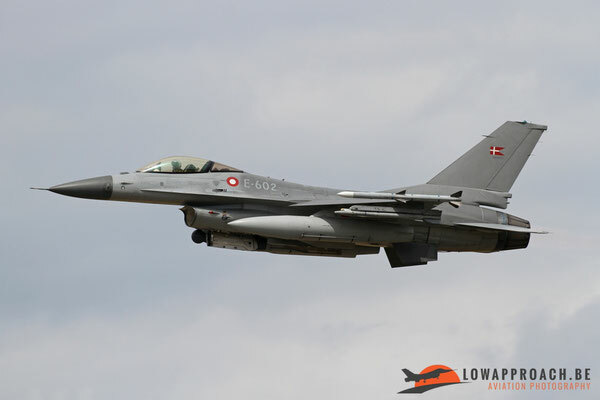 From Denmark we saw the arrival from a duo of F-16’s, one single seater and one double seater. 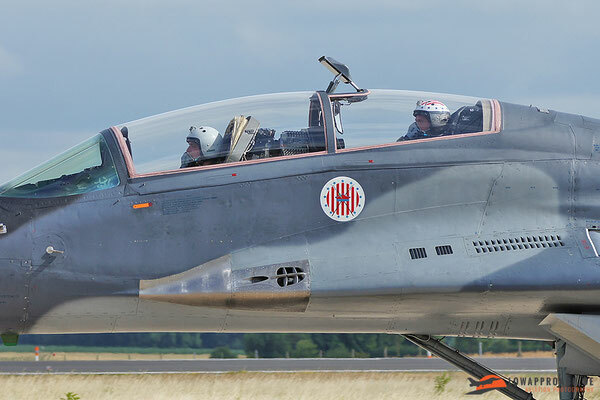 The double seater had a special painted tail which stated “JSF Test Support”. 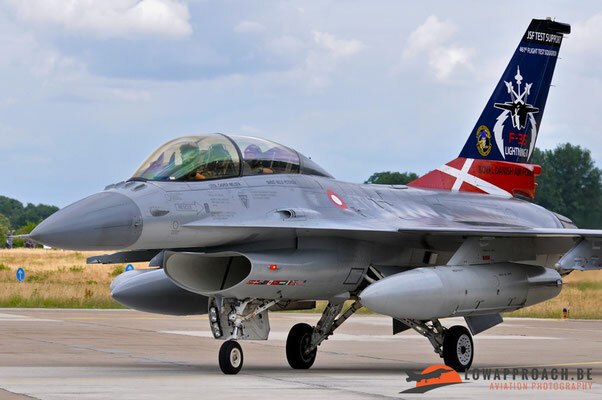 This F-16BM has been stationed in the United States for a couple of years in support of the F-35 development after Denmark had chosen the F-35A as their future fighter aircraft. 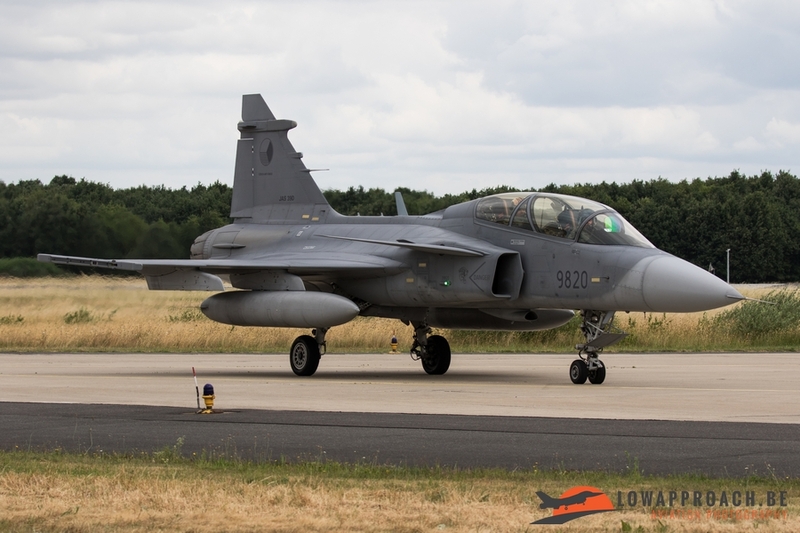 Apart from the 2 Fighting Falcons also a Challenger 604 from the Danish Air Force came over to join the party. 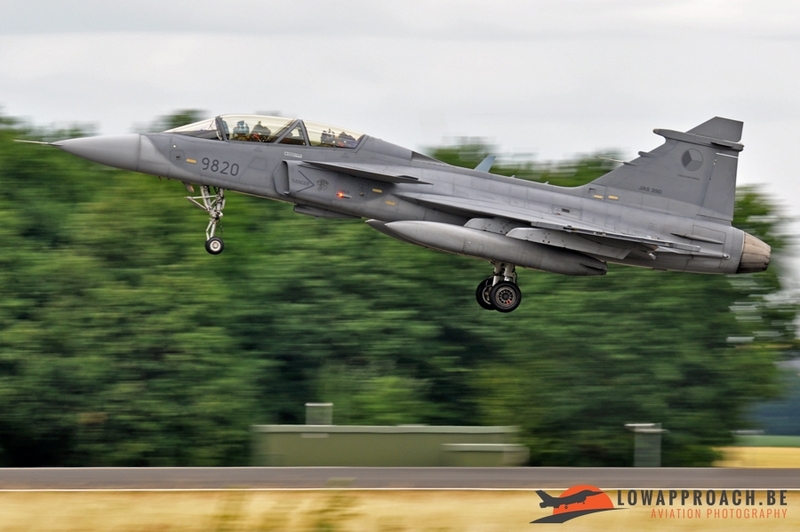 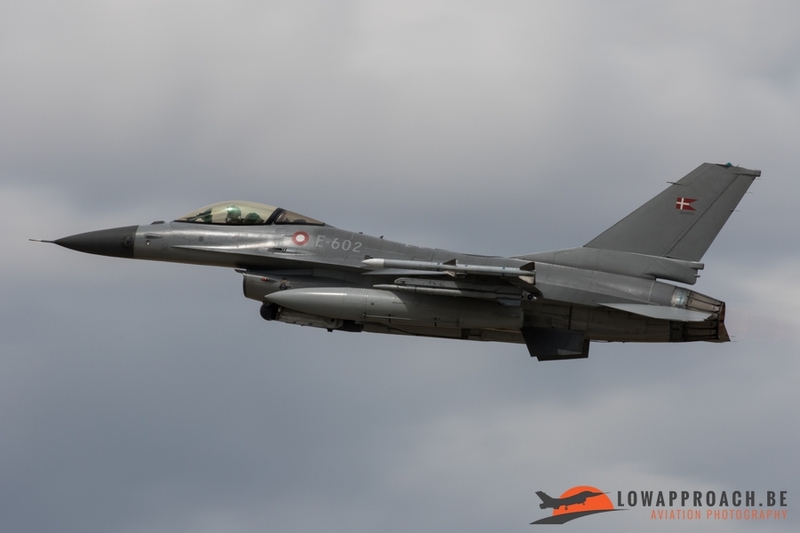 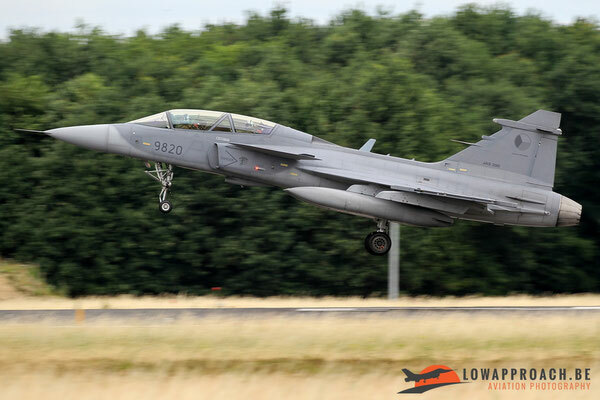 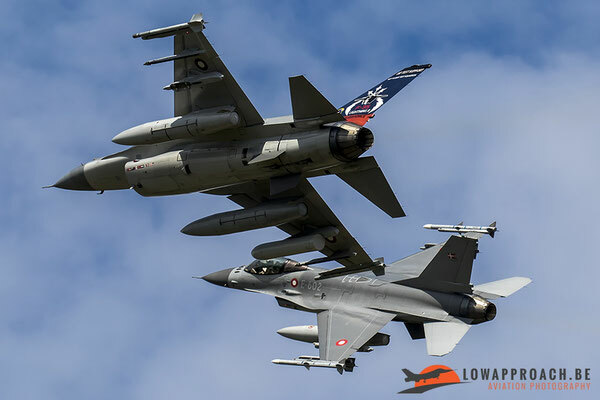 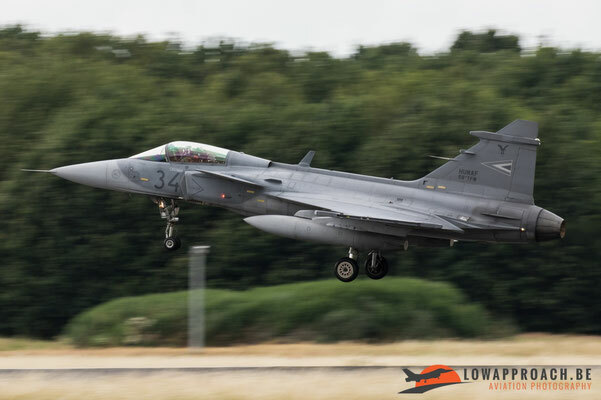 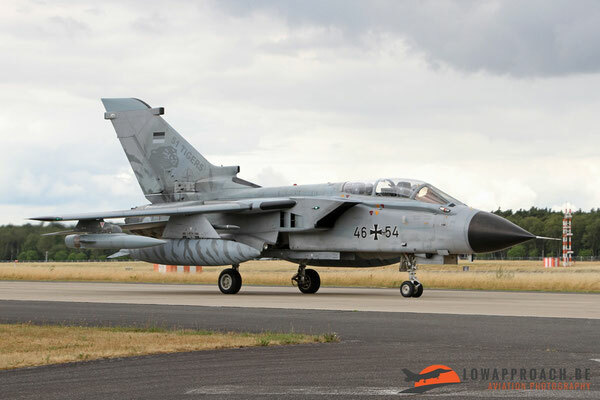 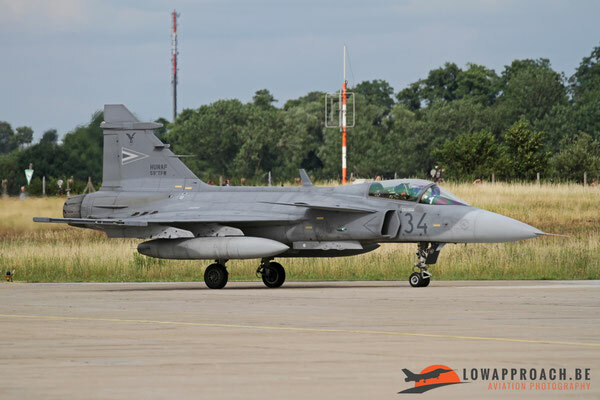 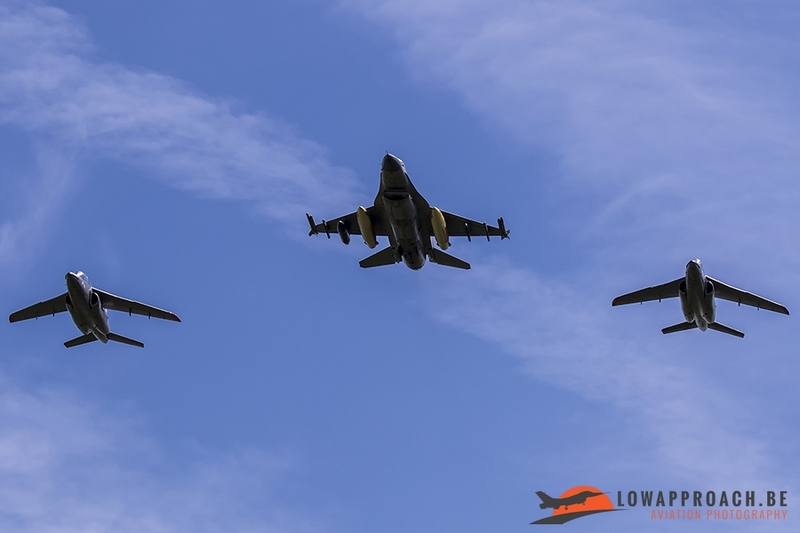 Both the Hungarian and Czech Republic Air Force provided a Saab JAS-39 Gripen for the event. 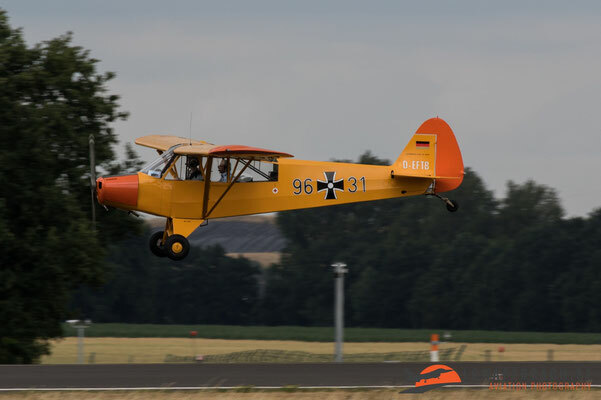 While the Hungarians sent a single seat C-model to Geilenkirchen the Czechs sent the double seater D-model. 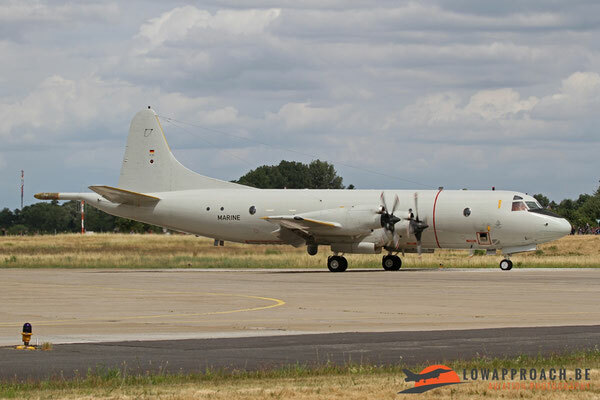 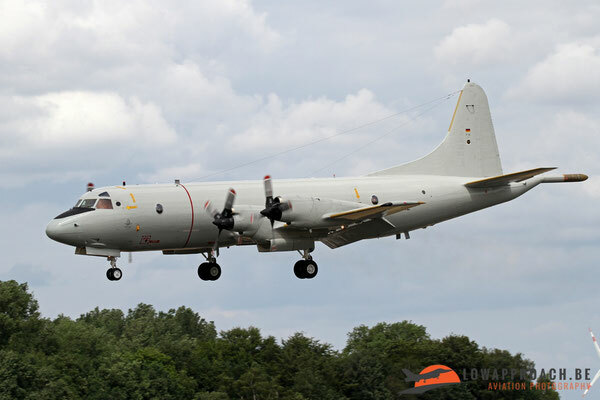 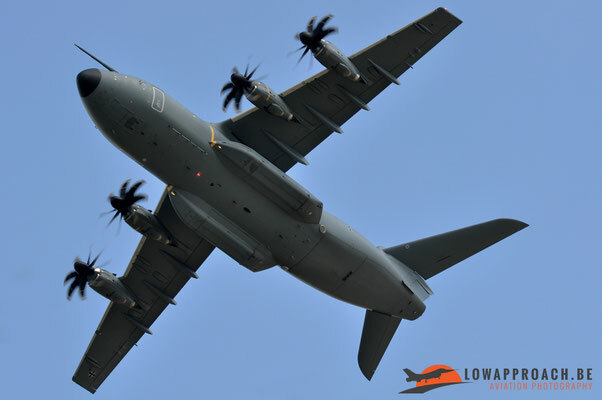 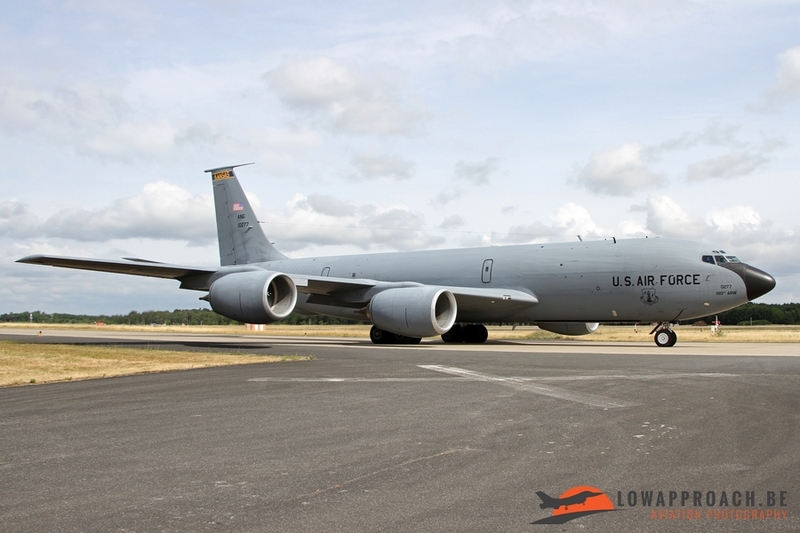 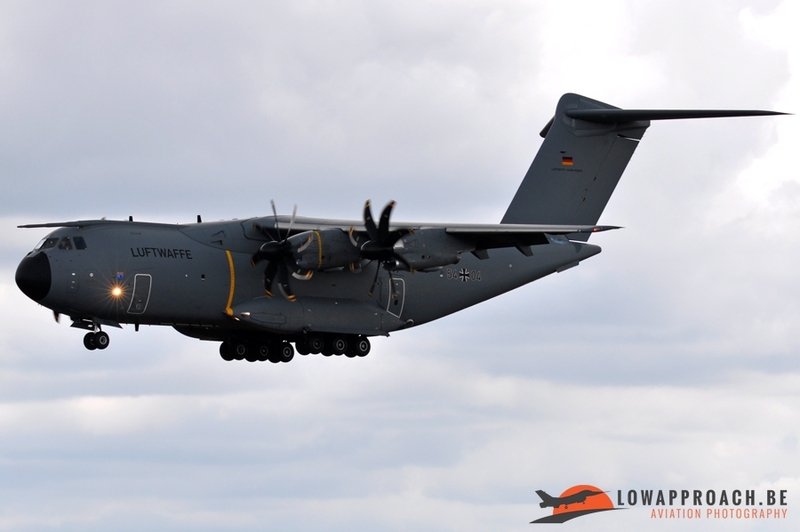 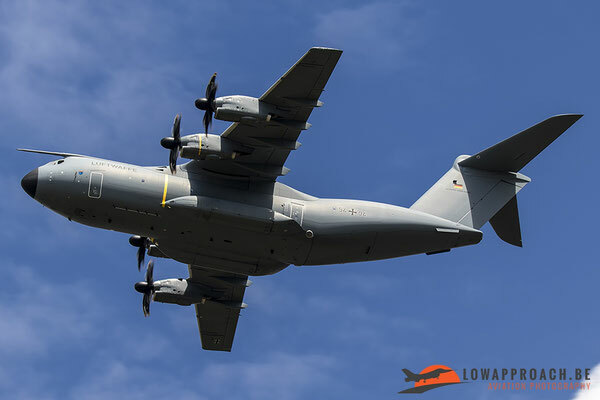 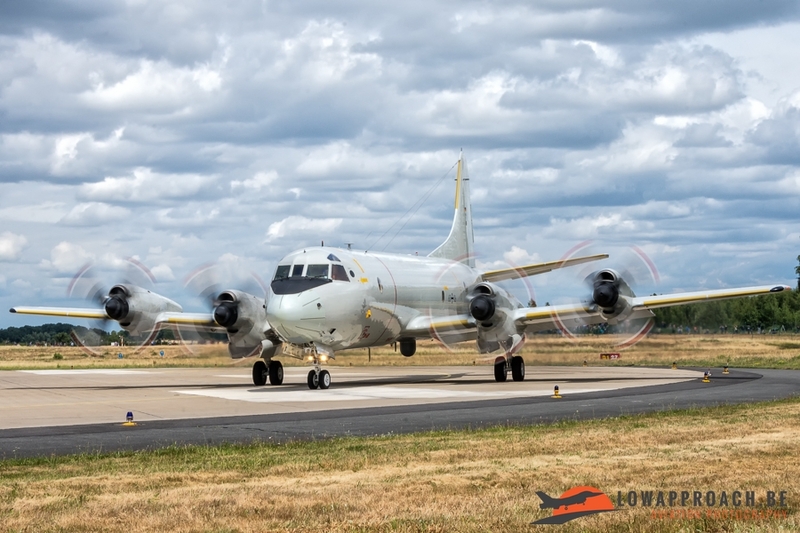 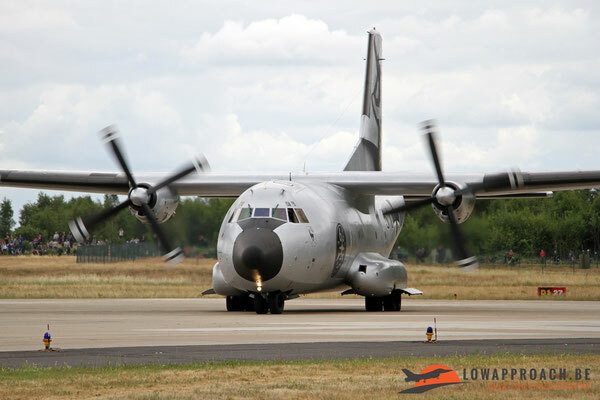 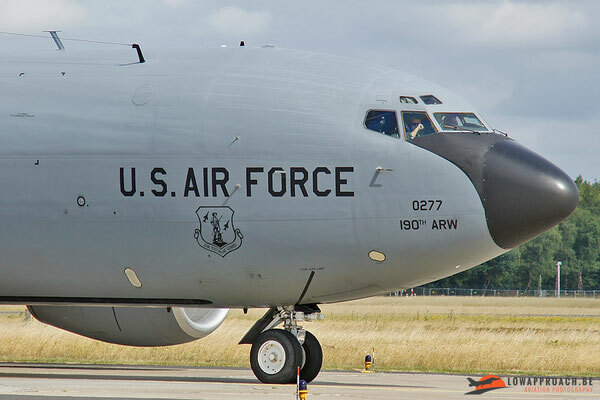 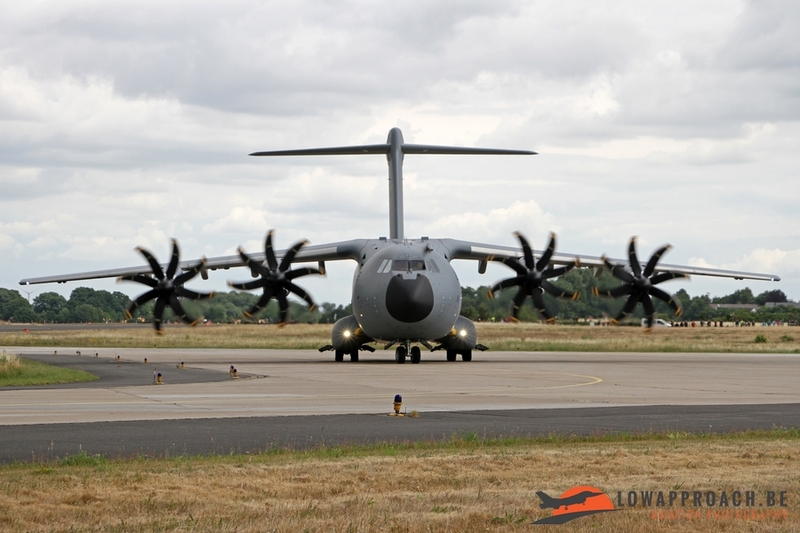 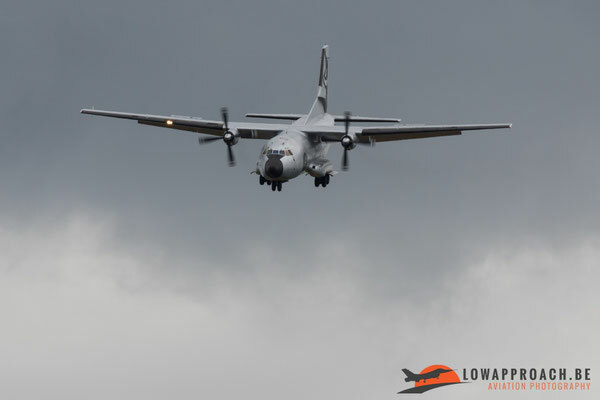 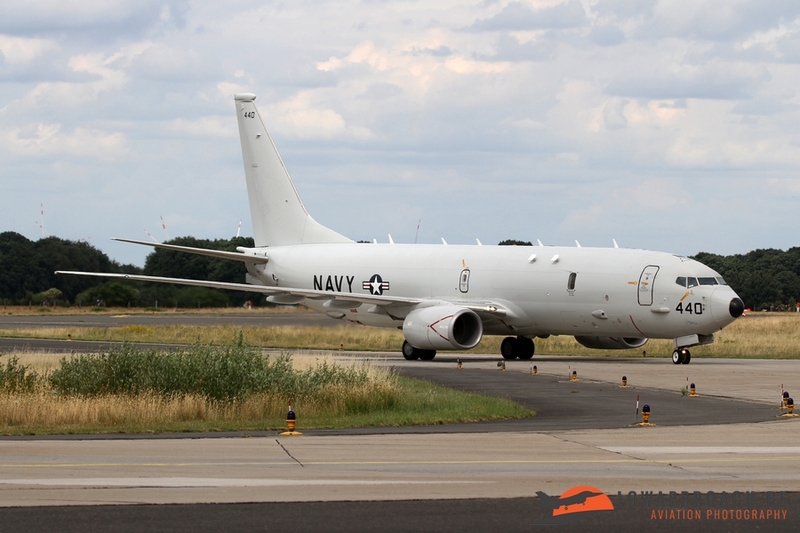 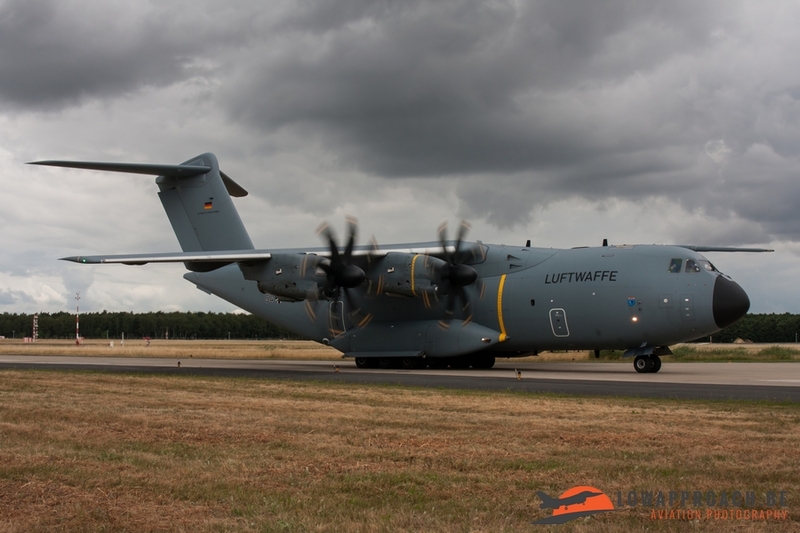 Both countries also sent a transport aircraft to Geilenkirchen. 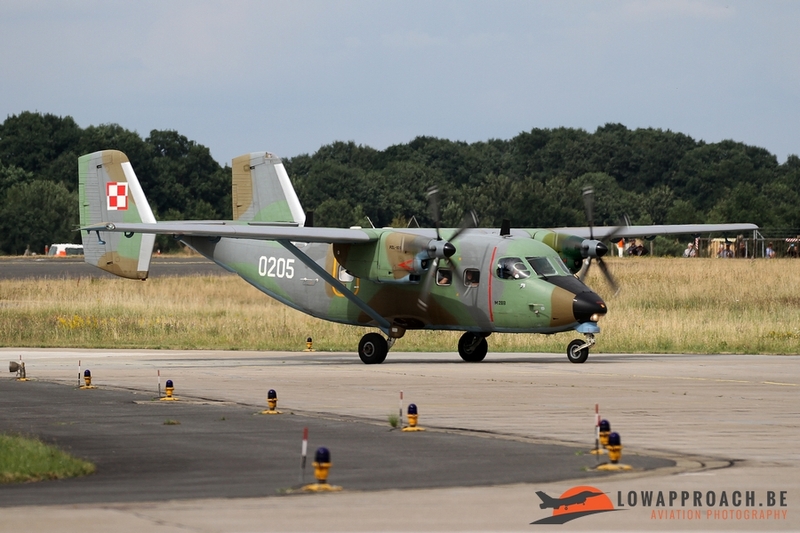 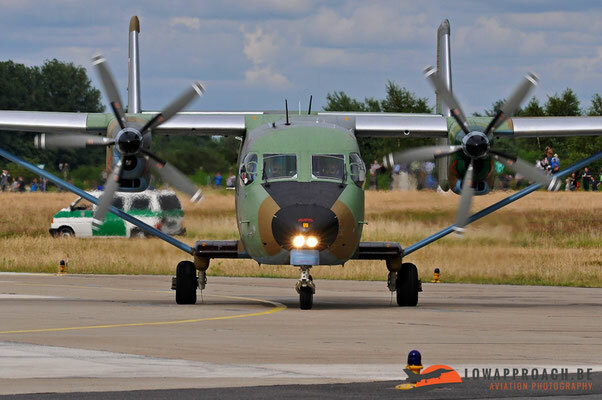 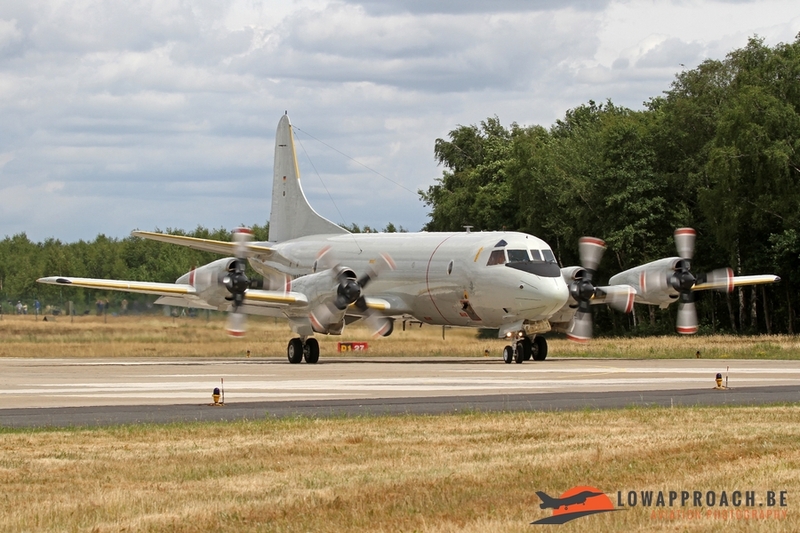 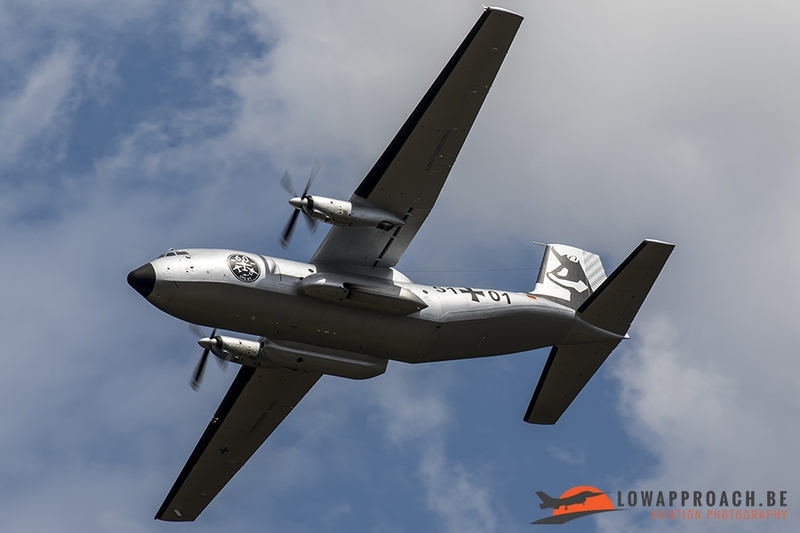 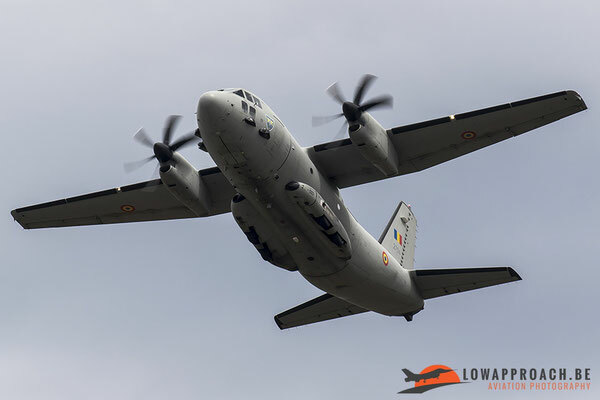 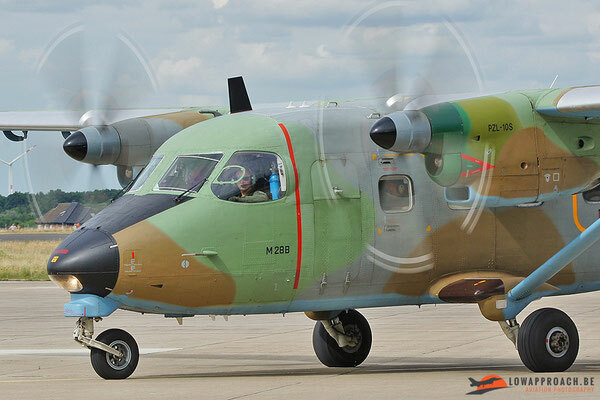 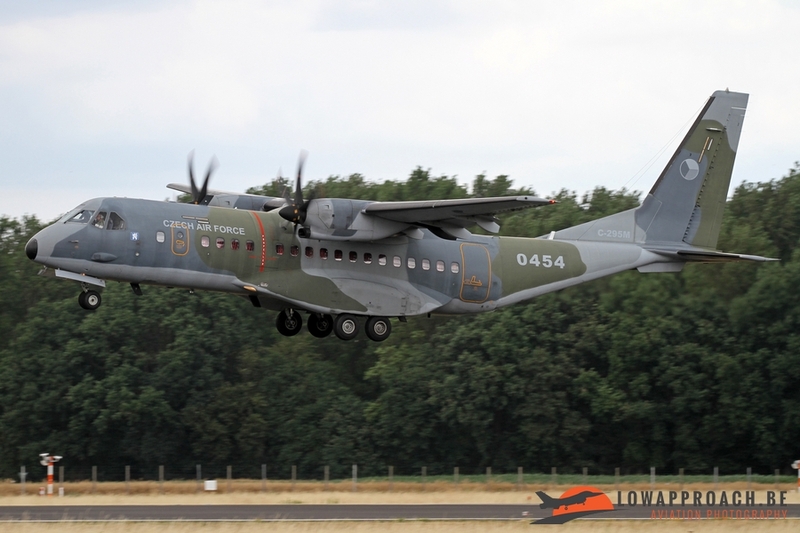 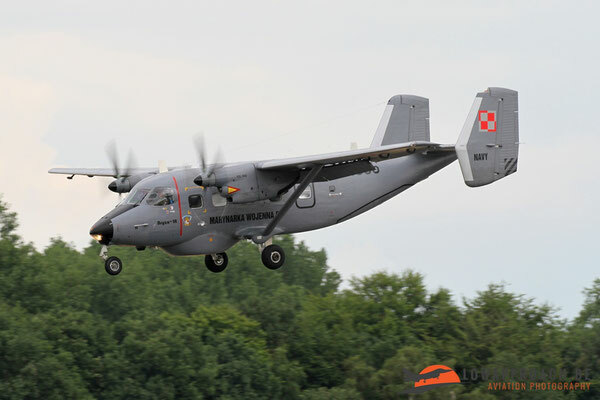 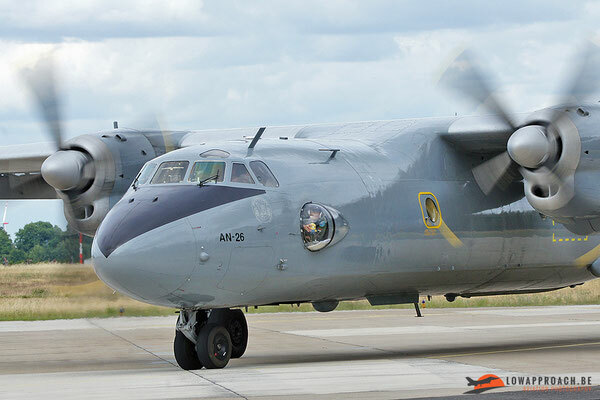 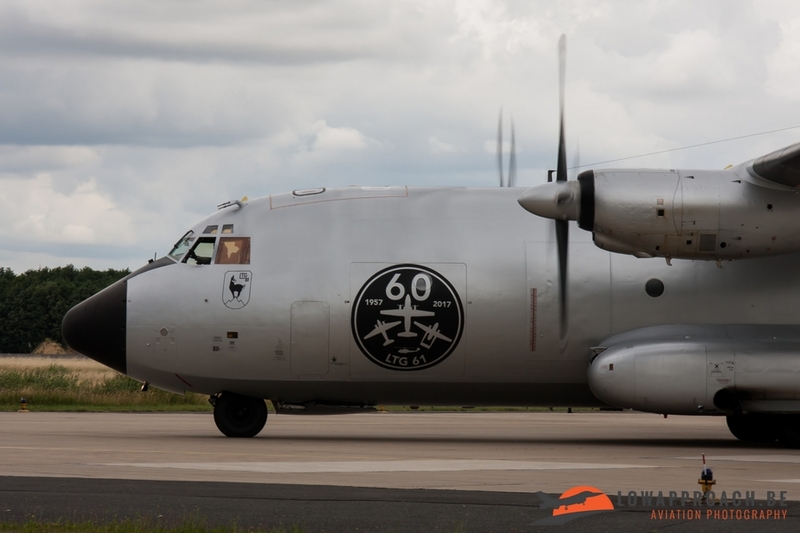 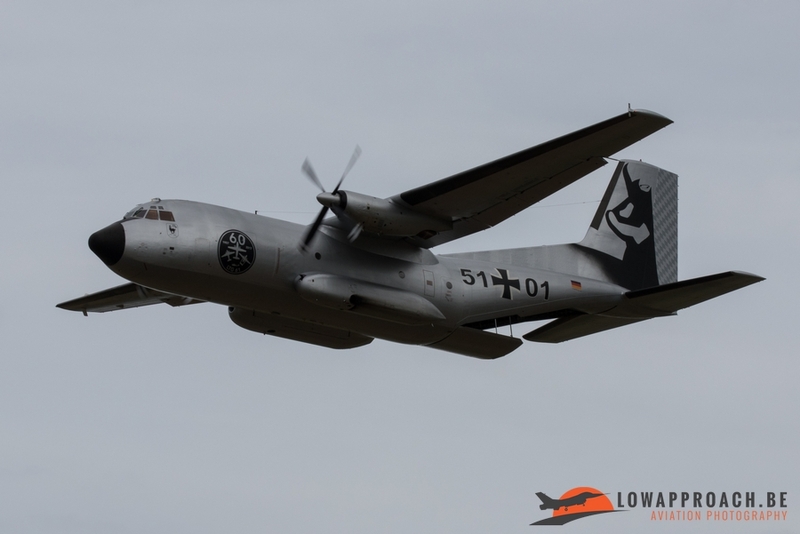 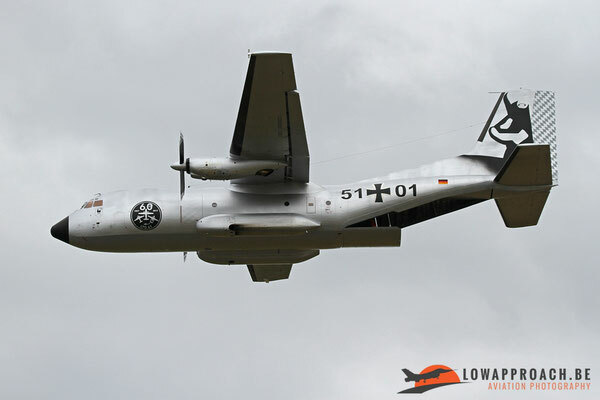 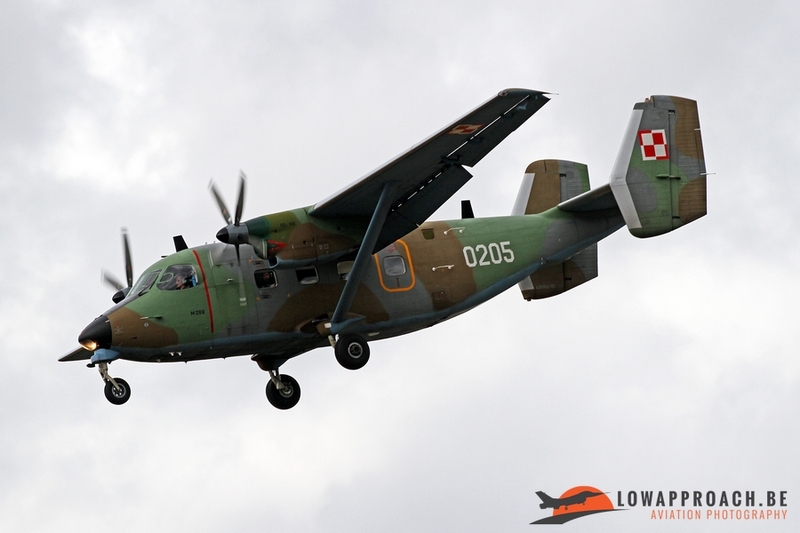 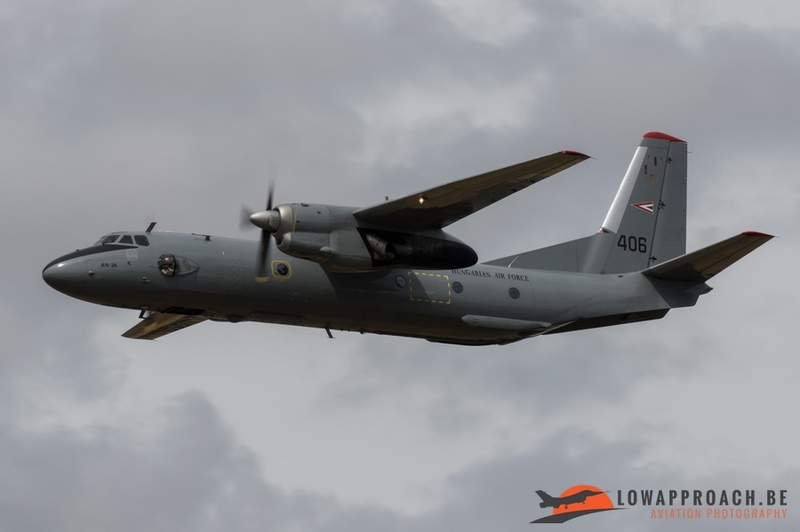 The Czech delegation came over with a Casa C-295M and the Hungarians brought over an old Soviet workhorse, the An-26. 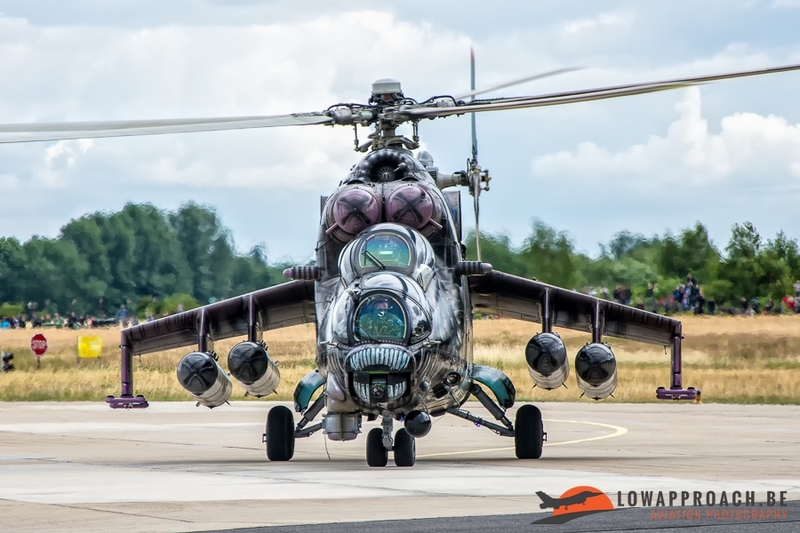 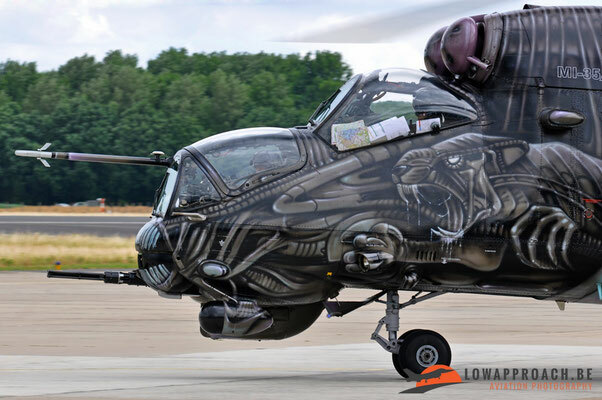 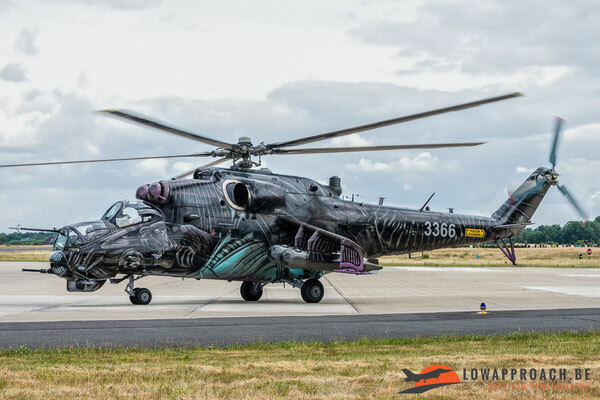 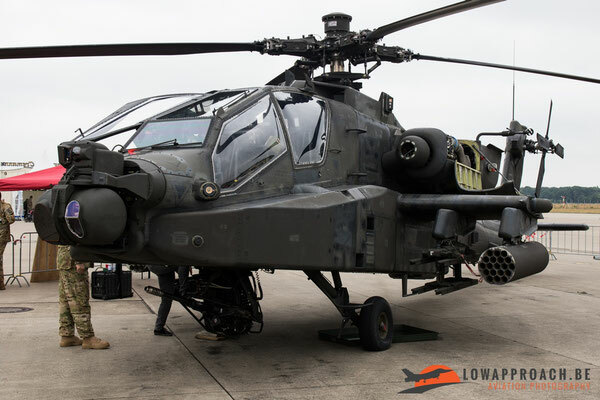 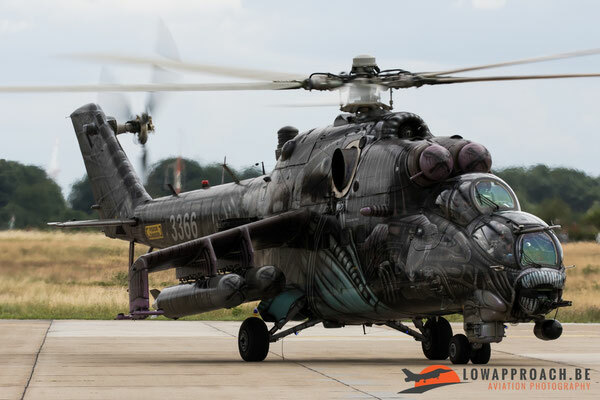 The Czech Air Force also brought over a former Soviet helicopter, a Mi-35 Hind and this helicopter still wore the 2016 paint scheme from the NATO Tiger Meet. 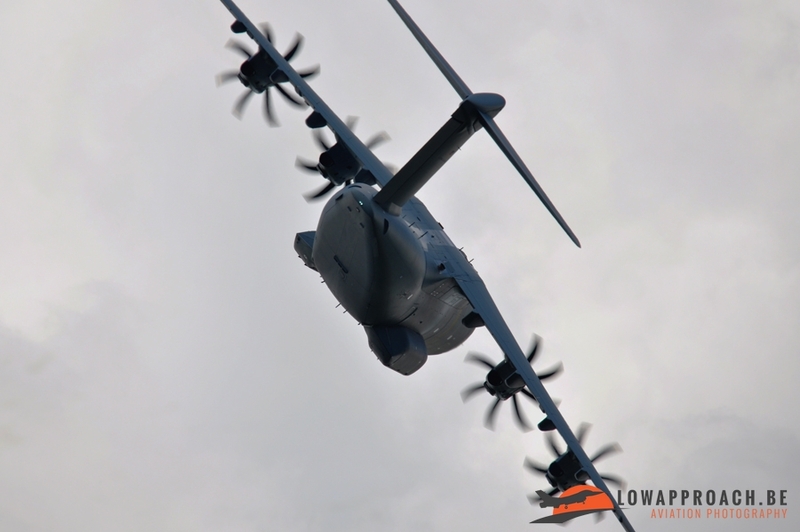 Apart from all the military participants also a couple of civilian aircraft turned up to join the static display. 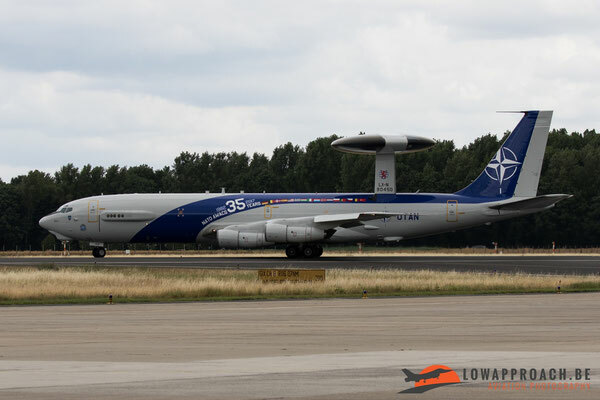 One of those was for many spotters one of the most interesting planes that we saw arriving during the spottersday. 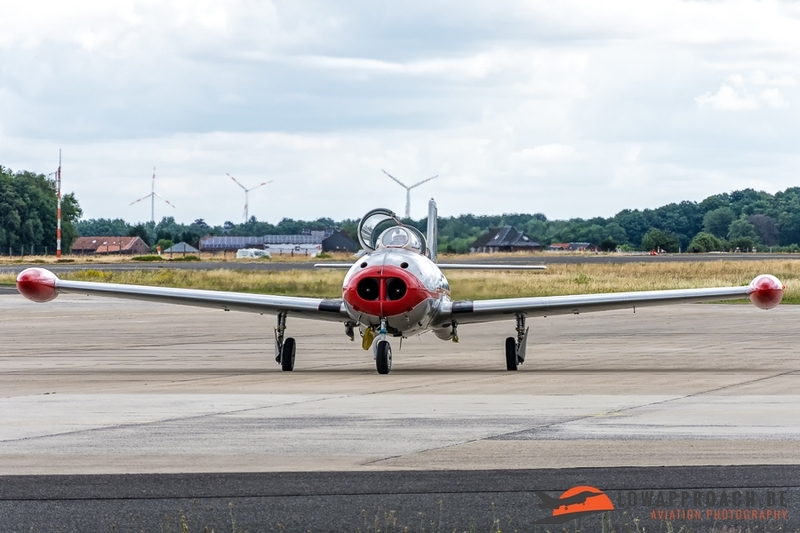 This was the Hispano HA.200D, ex-Spanish Air Force C.10B-67 and now registered D-IWMS and flying for the Flugmuseum Messerschmitt . 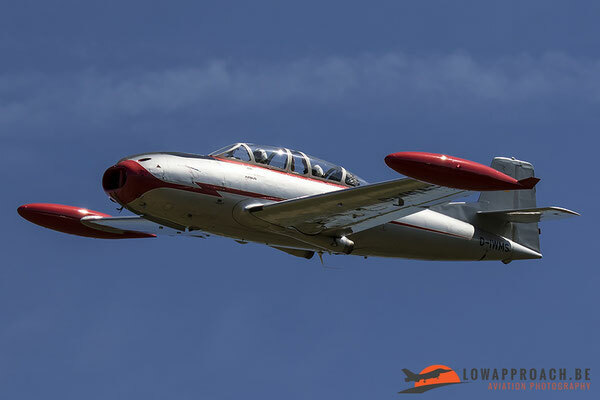 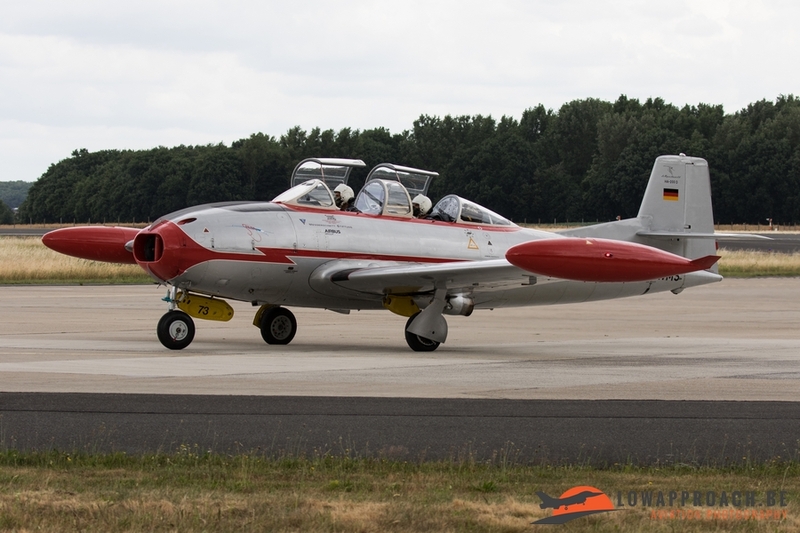 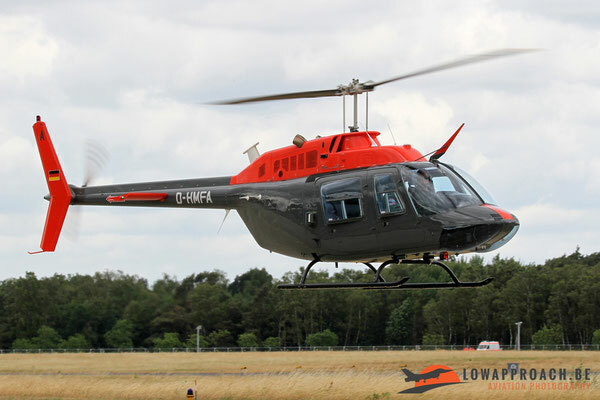 Other civilian aircraft that arrived were a Bell 206B Jet Ranger III that is used within the German Heeresflieger for the training of new pilots and a Piper L-18C that used to be part of the Luftwaffe. 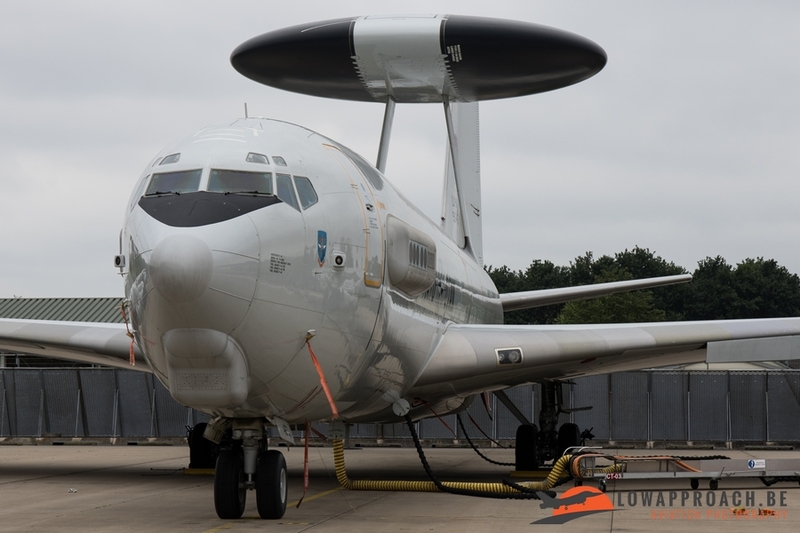 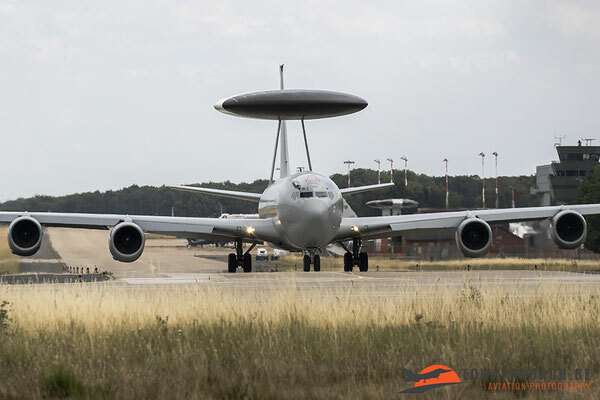 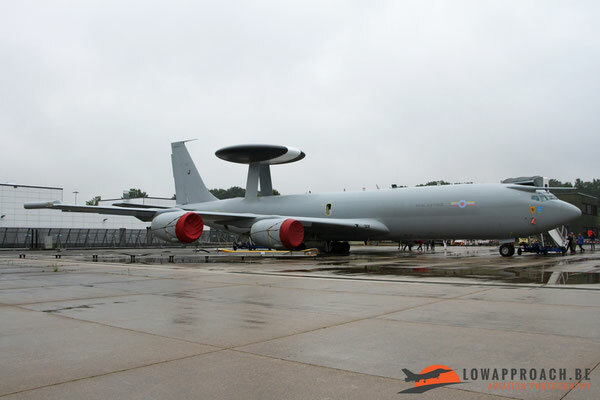 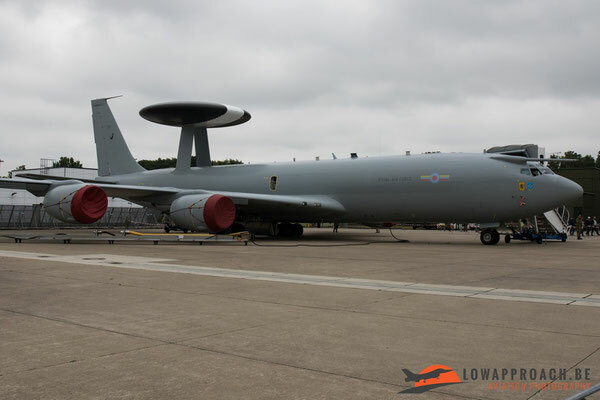 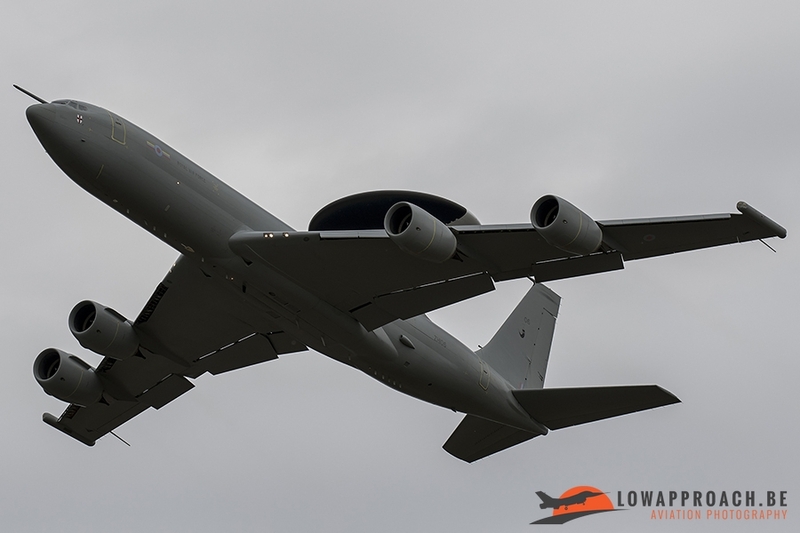 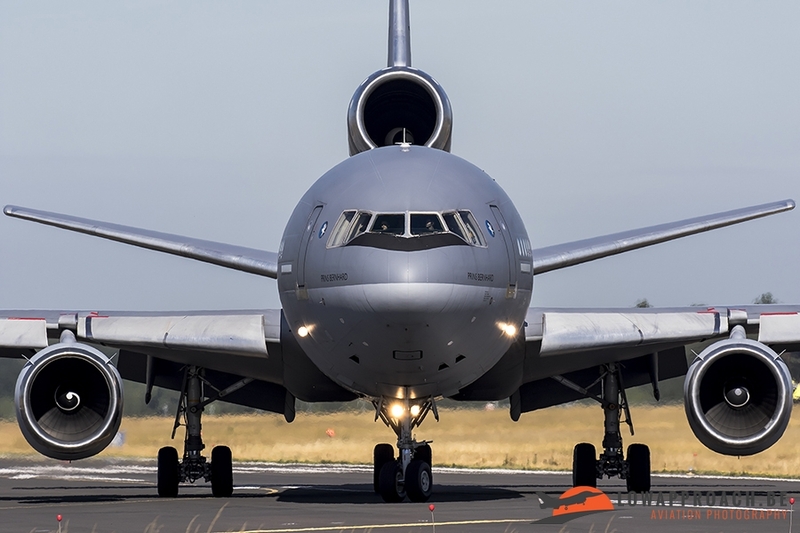 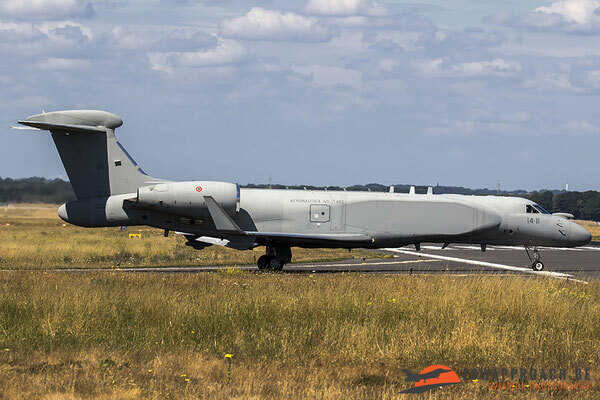 We can not end our report from the spottersday without pictures from the anniversary bird, the E-3A Sentry which celebrated its 35th anniversary in 2017. 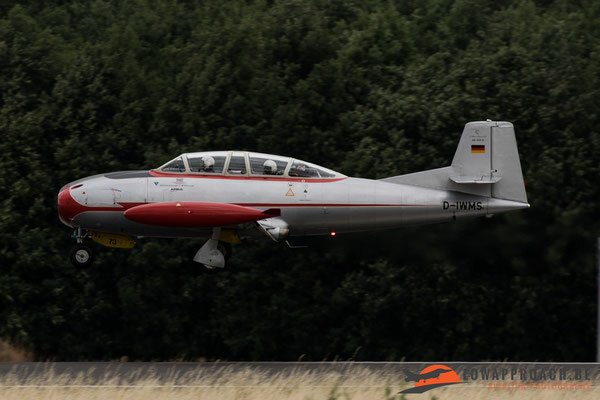 At the end of the spottersday we saw the return from E-3A LX-N90450. 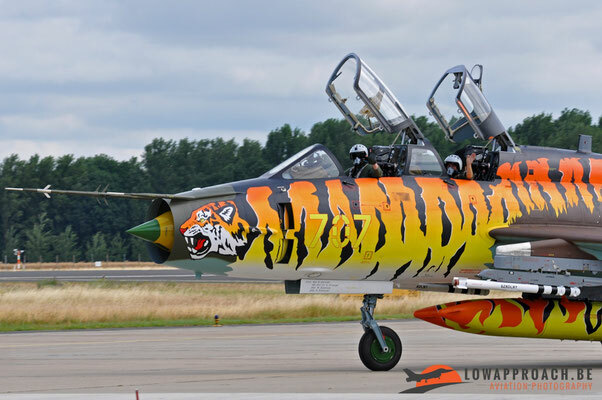 For the 35th anniversary, this airplane has received a special paint. 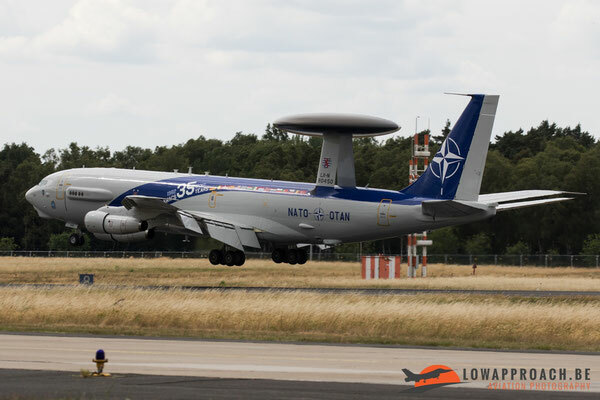 Before landing the aircraft the crew of this AWACS treated the spotters on some very nice approaches to the joy of the attending photographers. 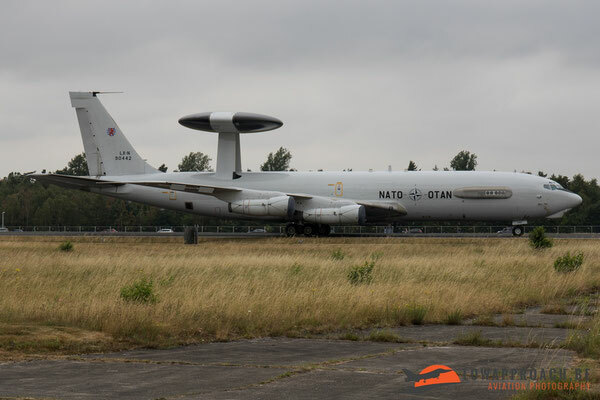 After a successful spotters day on Friday Laurent decided to also visit the actual Open Door on Saturday, although the weather forecast was far from ideal. When he arrived at the airbase around 9.30 in the morning there was already a long cue of cars in front of him to get to the parking, but the worst still had to come. When he finally found his parking spot (after more than 2 hours), the people had to cue again at the security checks and this for many hours again and this is the pouring rain. Laurent finally arrived on the exhibition area around 13.45 hrs in the afternoon.... so more than 4 hours after he had arrived at the airbase ! His initial plan was to enjoy the various food and drinks stands from the various NATO countries that are based at Geilenkirchen (and photography those aircraft that had arrived before or after Friday), but unfortunately Laurent had the impression that there were less than during previous events, which was a bit of a shame. Where else can you enjoy a Belgian beer, taste Norwegian salmon (with aquavit), a Canadian Caribou-burger and finish with an Italian Ice-cream... In the past Geilenkirchen was also the ideal place to learn a bit about the various countries, and perhaps start planning your next holiday, but this aspect had virtually disappeared completely, the otherwise full main hangar was empty with not a lot of activity. However, in between the rain he did managed to photograph those aircraft that had arrived before or after the spottersday. 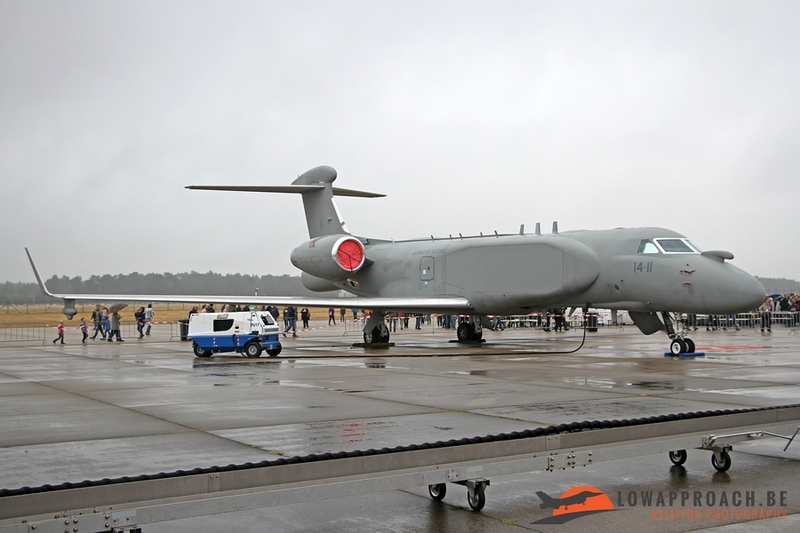 His personal favorites of the day were the brand-new Gulfstream E-550A CAEW, the Conformal Airborne Early Warning Aircraft from the Aeronautica Militare Italiana and the sand-colored Boeing CH-47F Chinook from the US Army, which are not really regular airshow visitors. After a last (Belgian) beer he decided to go home, and to his surprise he discovered that many made that decision before him, the platform was virtually empty, so he finally managed to photograph some of the larger aircraft without people in front of them, like a couple of local E3A Sentry AWACs aircraft and an E-3D from the Royal Air Force. 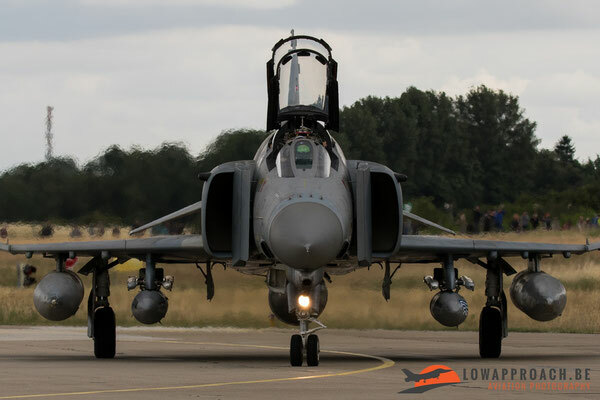 Finally he wants to thank all the countries who allowed him to take shelter for the rain during this day, Denmark, Norway, Germany and off course the Belgian Air Force who had a large display celebrating the history of the Belgian Air Force ! 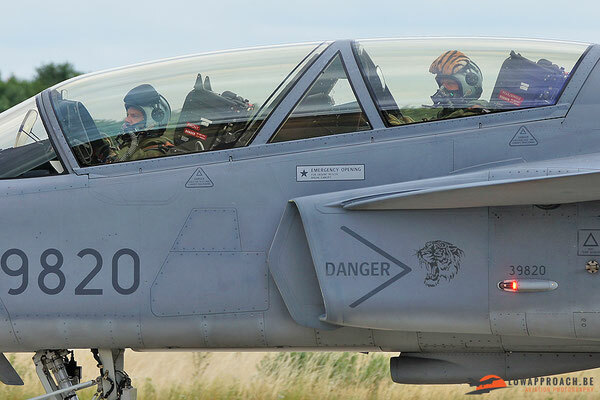 Dirk was more lucky on the second day of the Open Door, the organization learned their lessons and came in action to solve all the problems from the first day. 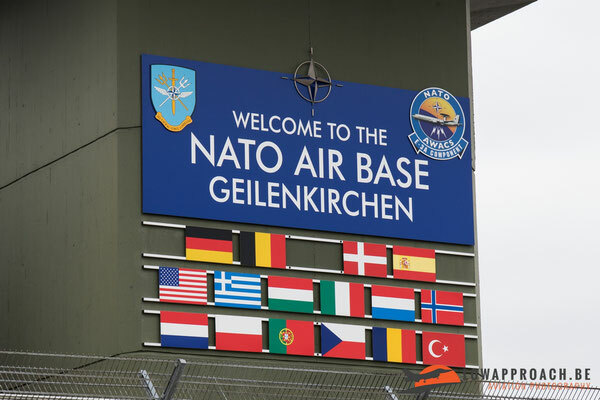 It took Dirk 40 minutes from entering the base until getting on the exhibition area. 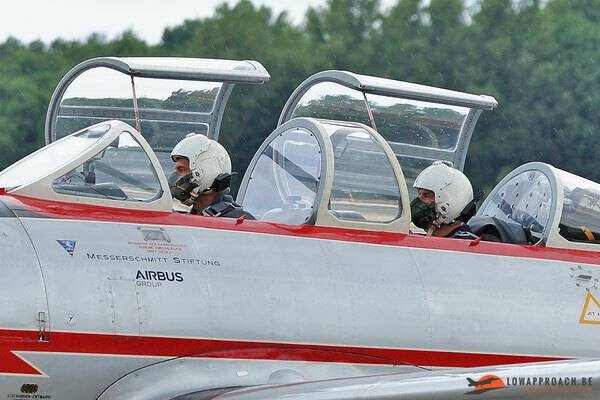 Also the weather was a little better than on Saturday, it was dry until afternoon. 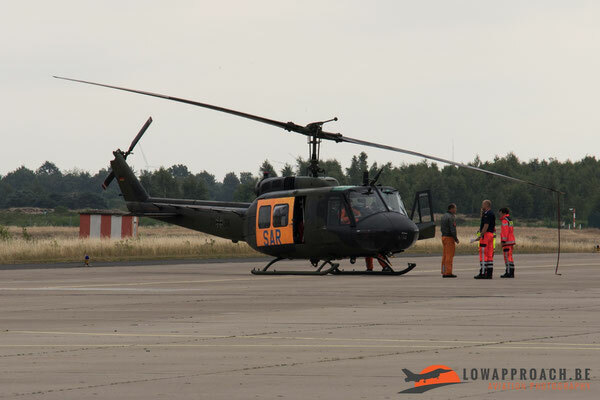 When Dirk arrived he saw the arrival of the German Air Force Bell UH-1D in SAR configuration. 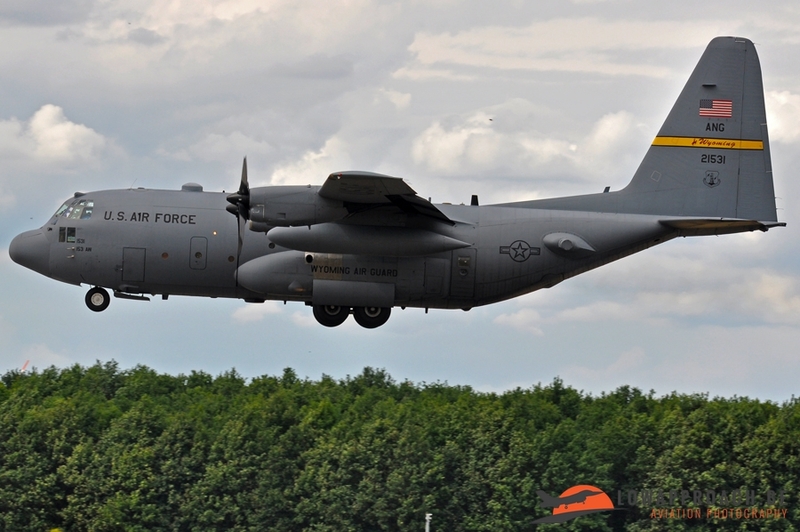 It arrived to give medical assistance if necessary. 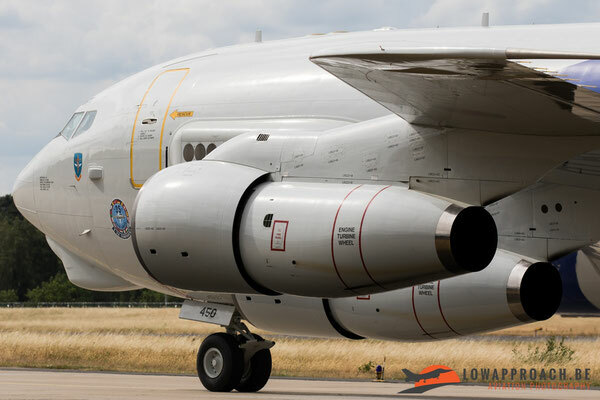 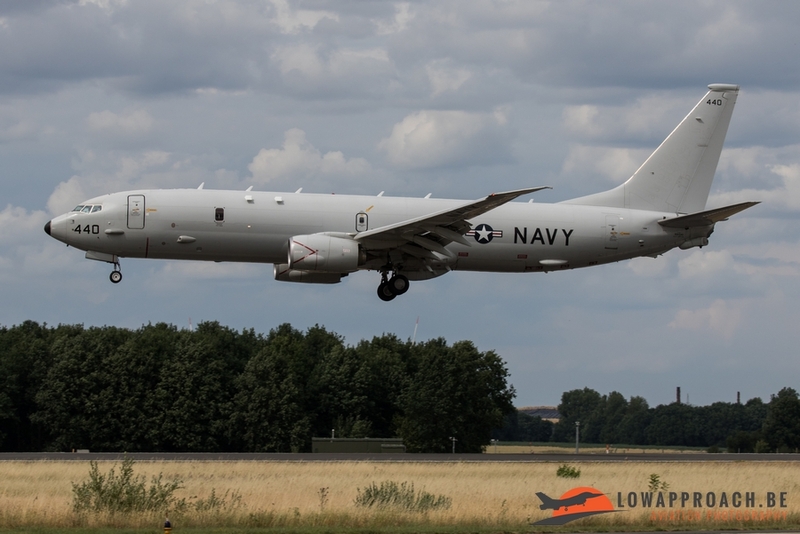 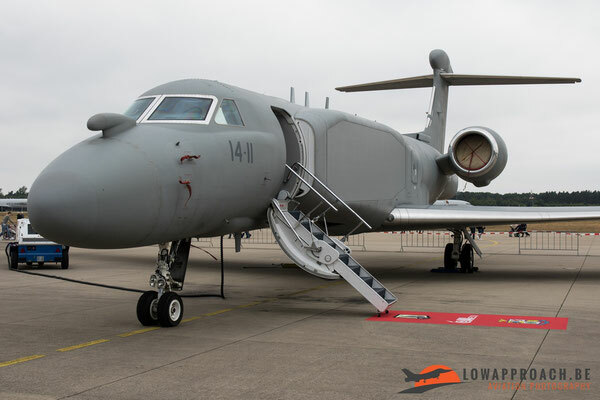 The highlight for him was the Gulfstream E-550A CAEW from the Italian Air Force and the two Hellenic Air Force F-4E AUP Phantom II’s that are still going strong. When the rain arrived it was time for him to go back home. Below a small selection from the pictures he took on Sunday. 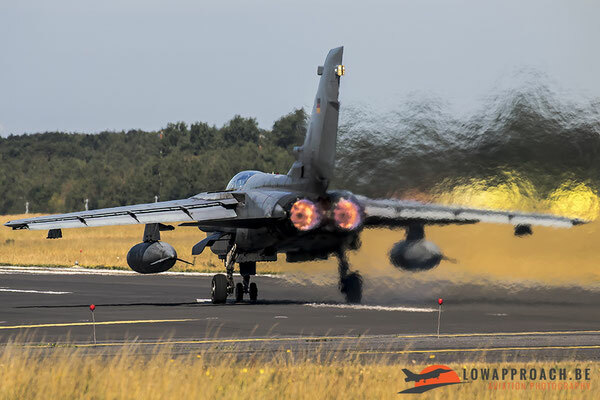 Tim went back to Geilenkirchen on Monday to see the attended aircraft departing back home and made following pictures.